Take a deep breath; we are about to embark on an epic journey through the world of location sound microphones. Yeah, I know, sounds like a bit of hyperbole, right? If you read all of the ads in the trade magazines, hang out on some Internet sound forums and talk to sound mixers, perhaps you have reached a sublime level of crystalline understanding about location sound microphones OR more likely, you may be a little confused by all of the conflicting information out there like most us. That's what makes this an epic journey; there are so many microphones out there and so much conflicting information. Everyone seems to have his or her favorites and everyone disputes how much you need to spend to buy a great microphone. I decided to wade into this article with an open mind and some audio knowledge but I am decidedly not a professional location sound mixer. Since I produce and shoot video myself, and often do my own sound recording, I am writing this article for an audience of camera owners like myself who may know a little about location sound, but may not have the chance to audition this many microphones in person before buying one. If you are a cameraperson, director or producer who buys, rents and uses professional sound gear, this article will provide some good starting points in your search for the right microphone. 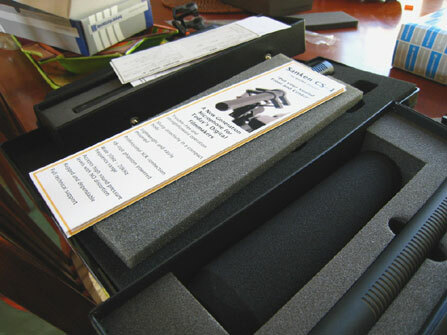 I hope that by reading about my experience with these microphones and listening to some samples I have recorded in several different types of situations, you will be armed with knowledge that will help you make an intelligent buying or rental decision so that your projects will have a polished professional sound mix. I am not an engineer and I don't know all of the answers but I can tell you that after reading this article and carefully listening to the recorded samples, you will have saved yourself several days of shopping, internet research to hunt down disparate sound samples and lots of misinformation that you might hear from uninformed sound forum posters, salespeople or retailers who just didn't do their research or have a vested interest in not being unbiased. There are no clear-cut winners and losers amongst these microphones; this review is not a contest. All of the microphones I tested and reviewed are capable of excellent sound. Not a single one of the microphones sounded "bad". Some were better than others or stood out from the rest for specific sound qualities though, the purpose of this article is to help you find the best microphones for your needs, taste and budget. This is why I decided to review microphones that range from U.S. $259.00 in cost to almost U.S. $2,000.00. It's all about discovering which microphones suit your needs as well as your finances. In order to understand why buyers want better quality audio, it is helpful to know why video and film shooters care or should care about sound quality. With the democratization of video equipment in the late 1990s and early 2000s, there was also an influx of new users creating video and films. When it took a minimum of a $50,000.00 to $100,000.00 investment in gear to create professional quality video, the typical broadcast or industrial camcorder user was an experienced professional. Video and film shooters manned the camera and usually a professional sound mixer, sometimes along with a boom operator was included on the call sheet. When the economic equation required producing quality video changed to needing just a few thousand dollars of gear to create the same relative image and sound quality, tens of thousands of new users began to shoot and produce web content, television, films, corporate video and many other types of programming using the new inexpensive gear. As the number of camcorder users increased, they were doing their own sound mixing on video and film shoots and learning as they went along with a lot of on-the-job experimentation. In 2001, I wrote a Low Cost Shotgun article because at the time, it seemed that everyone was looking for the right microphone to use with the newly popular low-cost Mini DV camcorders. The word of the day was cheap. When your new MiniDV camcorder cost $3,000.00 and made decent quality pictures, who wanted to spend $2,000.00 on a microphone? In this era, significantly reduced production budgets were eliminating crew positions, often including the sound mixer and or boom operator. There was a whole influx of new users who knew very little about sound mixing that were out shooting their projects and looking to purchase audio gear. Many people seemed to think that they could obtain adequate sound quality with a camera-mounted microphone. As most of us know, you cannot refute the laws of physics but many learned about this the hard way. We are beginning to see significant change in audio for video production with the advent of the Hi-Definition era. While the costs for HD production have fallen rapidly as the demand for HD programming and the gear to shoot it has risen, in general, HD production gear is significantly more expensive than standard definition video gear was. HD camcorders record digital sound with significantly better quality then their generally poor sounding Mini DV and analog sound Betacam SP predecessors did. In my experience, the newer generation HDV and HD camcorders have better microphone pre-amps and quieter audio paths than the previous generation MiniDV camcorders had. Many broadcast and delivery specs for programming now accept and often expect edited masters be delivered with multi-channel surround sound. It seems that with the advent of HD production, filmmakers and videographers today seem to be looking for better quality sound than they were just a few years ago. Hi-Def puts increased demands on the quality of the sound expected as well as the picture. More end users are listening to HD programming on high-end, high-resolution sound systems that they have added to their 60" HD sets. The day of the average viewer hearing their television and films through a 2" bad sounding mono speaker is not completely over but that day is thankfully dying a quick death. In 2001, I wrote, "there is really no such thing as a good all around microphone." Six years later, I feel that this is just as true as it was in 2001. In the ensuing years since then, there have been no new technical revelations that allow a microphone to function well in all sound situations. There are multiple-capsule systems that do allow a lot of flexibility though such as the Schoeps Collette system, the Oktava MK-012 and the Sennheiser K6/ME system as well as several others that let you use different types of capsules that each have different pickup patterns in conjunction with a dedicated power-supply/base. I have used several of these systems and they can be a decent, if not perfect solution to those of us who shoot in many different sorts of physical locations. These modular systems use the same power supply, matched with several different capsules, each with different pickup patterns. The goal is always to record the subject with the most natural, uncolored sound possible and to eliminate as many of the extraneous sounds not emanating from the subject as possible. These extraneous sounds are often referred to as "off-axis sound", meaning that in a practical sense, when you are recording a line from your talent, you want to hear as little of the traffic sound from the road next to them as possible while hearing their voice clearly and with great detail. What Are The Most Common Microphone Types and Pickup Patterns For Location Sound? Long shotguns These microphones, in my opinion, are typically most useful for recording sound for noisy exteriors or when you cannot locate the microphone very close to the source. Long shotguns typically have a very narrow angle of acceptance. 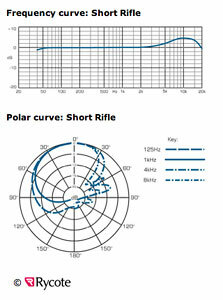 If you check out the polar pattern for a long shotgun, (an overhead visual representation of a microphone's pickup pattern), you will usually see that an unfortunate side effect of having an extremely narrow angle of acceptance is a lot of ancillary sound pickup at the rear of the microphone. As you might imagine, when shooting interiors, this means that the crew and activity behind the microphone, along with the room's reverberant characteristics are usually picked up as well, making long shotguns not very useful for recording interiors. Another practical concern of using long shotguns is that when combined with a suspension mount and windscreen and furry windscreen cover, a long shotgun is physically huge and long. This can be difficult to manage when there is not enough physical room to use the microphone under overhangs or in rooms with low ceilings and it's immense size and length can be a visual distraction for talent as well. Short Shotguns This short shotgun is the more diminutive relative of the long shotgun. 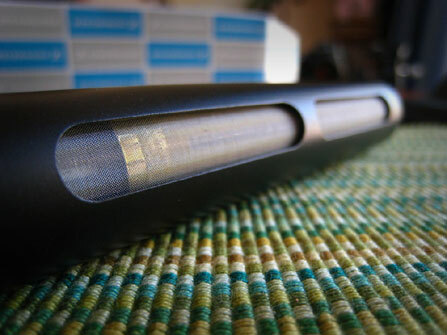 Most manufacturers that offer short shotguns also offer long shotguns, often in the same product line or with a similar sound quality, usually just with a different pickup pattern. Besides being physically smaller than a long shotgun, most short shotguns offer a somewhat wider pickup pattern than long shotguns, usually coupled with more rear axis noise rejection. 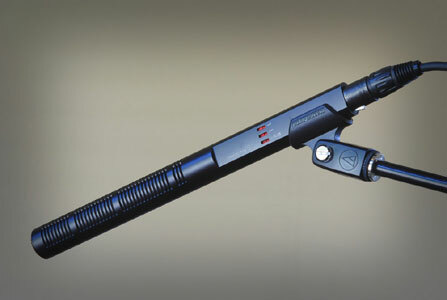 The short shotgun is probably the most commonly used microphone in location sound. They vary widely in cost and sound quality and almost all of the major audio manufacturers offer at least one, if not multiple iterations of the short shotgun. Generally, most sound mixers use short shotguns in normal exterior locations although plenty of interiors are recorded using short shotguns as well. Supercardioids A Supercardioid microphone has a pickup pattern between a cardioid and a lobar short shotgun with more off axis rejection than a cardioid but not as narrow of angle of pickup as a short shotgun. I know, what does lobar mean? 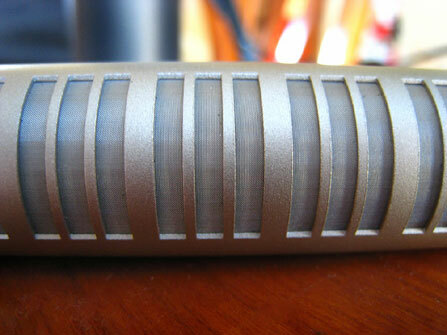 A microphone with a lobar polar pattern has the highest possible directivity. 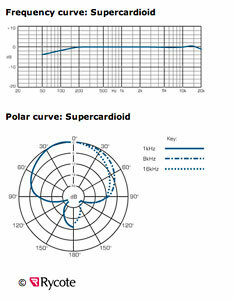 Lobar polar pattern is often referred to as: supercardioid/lobar, or hypercardioid/lobar polar pattern, but both supercardioid and hypercardioid patterns are slightly less directional than the lobar pattern. 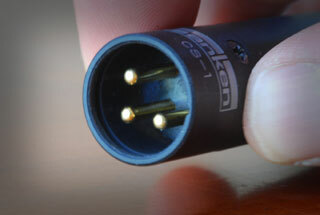 A lobar pick-up pattern is achieved with a shotgun microphone only. 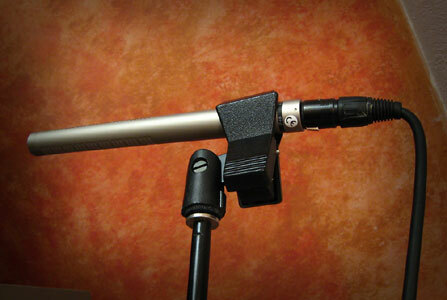 A supercardioid microphone also usually features more rear axis pickup than a cardioid. Four out of the twelve microphones I reviewed for this article were supercardioids or short shotguns with a supercardioid pickup pattern. There are some shotguns that list a line + gradient pickup pattern and some that just list the pickup pattern as supercardioid and some that label their pickup pattern as lobar. As with many descriptors in sound, there is some confusion about exact terminology. 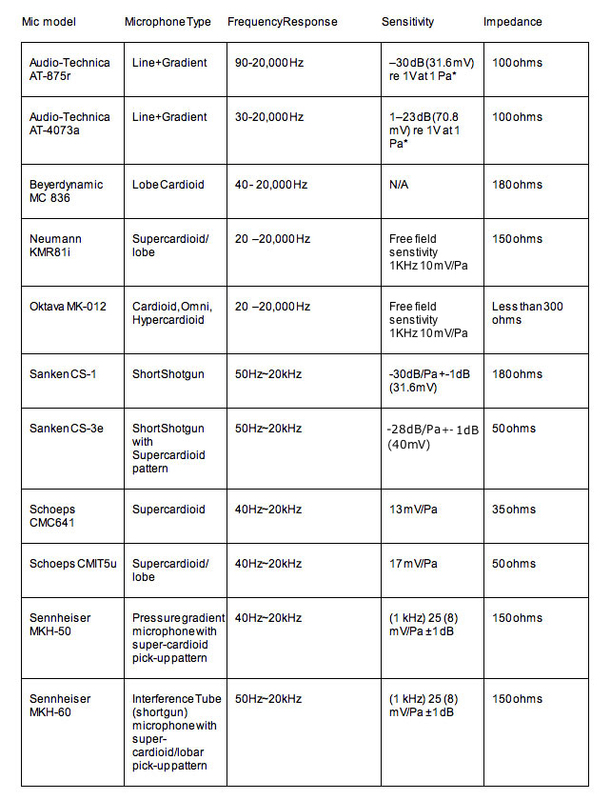 In my experience, supercardioid microphones typically are physically shorter than short shotguns but a lot of this categorization becomes whatever the manufacturer wants to categorize the microphone as. I have seen the Schoeps CMIT5u labeled as a long shotgun, short shotgun and as a supercardioid by the manufacturer, retailers and end users so keep this in mind as you read the product descriptions for each microphone. Where available, I have tried to include pickup pattern graphs for each microphone. 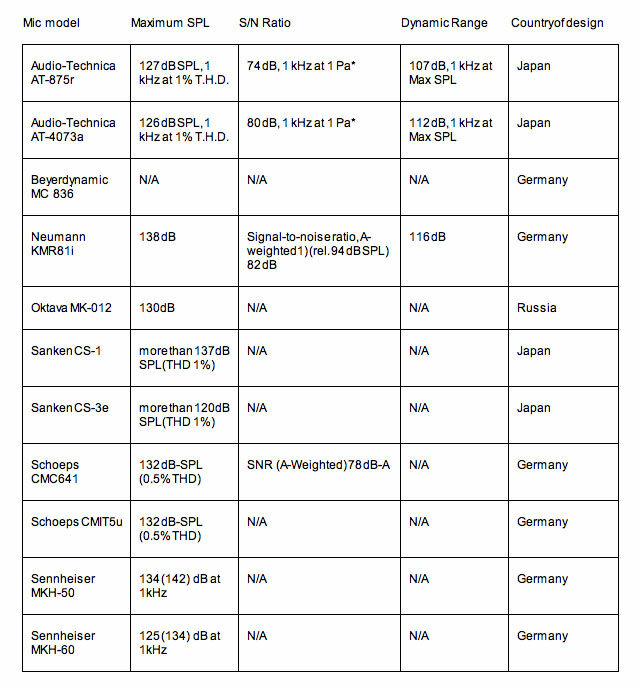 These graphs, along with the spec sheets for each microphone will tell you all you need to know as far as what kind of microphone each model is. Hypercardioids As you may have guessed by now, a hypercardioid has a similar pickup pattern to a supercardioid but it is a wider pickup area, therefore it will usually have less rear angle pickup than a supercardioid. Hypercardioids are usually more popular for recording interiors than most of the microphone pickup patterns listed above because they are capable of providing a more natural, open and less focused sound. 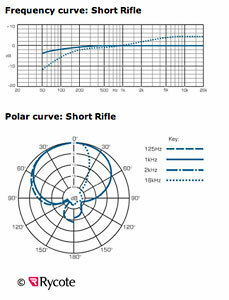 Using a hypercardioid with a wider pickup pattern also means it is easier to pickup multiple subjects with one boom. For hand booming dialogue scenes between multiple characters, a hypercardioid would not have to be pointed as precisely as a short shotgun or supercardioid. 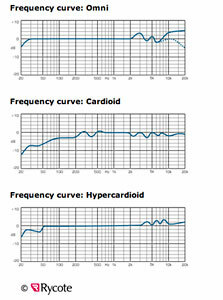 Cardioids Cardioid microphones have the widest pickup pattern of all of the microphone types I tested. The cardioid could be considered more efficient for picking up larger groups of speakers at a time and this type microphone might prove to be more efficient when trying to boom a fast moving subject. 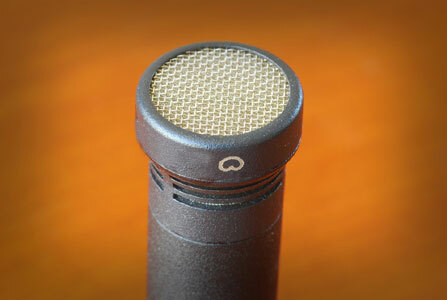 A cardioid microphone has very little pickup pattern directly behind the microphone but because the pickup pattern is so wide, the microphone does have a tendency to pickup sounds on the far sides of the microphone's pattern. An added benefit of all three of the cardioid microphones is that generally these types of microphones are physically shorter, allowing the microphone to be more easily used in spaced with low ceilings and tight spaces. How Do You Choose Which Type Of Microphone Pickup Pattern To Use For a Given Situation? As a rule of thumb, it's a good idea to listen to each location through at least a couple of different microphones that you think you might like to use. You may occasionally discover that a short shotgun will work for a given interior location better than a cardioid or the short shotgun may be a better choice than a long shotgun for some exteriors, it just depends on the situation and the recordist's choice of sound quality desired. This leads us back to square one; there is no perfect, all-around general microphone for the location sound mixer's bag. Brace yourself and budget yourself, you should seriously consider purchasing more than one microphone or at least a modular microphone system along with at least two capsules. Keep this in mind as you peruse the rest of this article, you can consider taking your total microphone budget and dividing it so that you can buy more than one microphone. This may sound a bit harsh to you, but if you have gone to lengths of purchasing a high quality camcorder, tripod, monitor, lights, grip equipment and all of the paraphernalia needed in order to produce film or video, you SHOULD consider spending a decent amount of money on your audio gear. 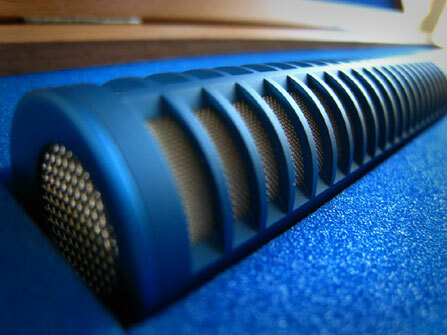 The single most important component of your audio gear is the microphone. Depending on your needs and expectations, you don't always have to spend a lot of money on your microphones, but it does makes prudent economic sense to NOT scrimp on the quality of your microphones. 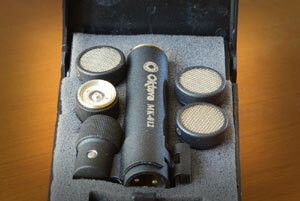 Buy the right microphones to successfully record the types of projects that you plan on shooting. Many newer users fall into the trap of buying a camcorder that is too expensive for their overall production budget, then scrimping on all of the most important support components like tripods, lighting and most importantly, the sound gear. Before you buy any production gear, you have to really know how to budget your funds to craft a well-rounded production gear package. Owning a great camcorder with a lousy tripod, junky lights and a bad sounding microphone is more common than you might believe. A cheaper camcorder with good quality support gear like microphones and tripods will result in a better looking and sounding project. As you read this article you will see and hear that you don't always need to buy the most expensive microphones to record great sound, but you need to know what to buy for your particular shooting style. After spending six months with all of these microphones, in my opinion, you need to budget for at least two types of shotgun/cardioid variant microphones along with at least one lavaliere microphone for most users. In the simplest terms, any of you who have purchased a camcorder like the Panasonic HVX-200, the Canon XL-H1, the Sony PMW-EX1 or the JVC HD-100/110 family can afford to purchase any microphone reviewed in this article. If you are reading this article and only have a $500.00 Mini DV camcorder, that is a different story, I would refer you to my original Low Cost Shotgun Microphone Comparison since in most instances it wouldn't make sense to buy a microphone that costs more than your camcorder. Since the low cost article was put on-line, many other low-cost shotguns/cardioids have appeared on the market to consider. For the rest of you who have dropped at least $8,000.00 to $10,000.00 or more on your camera package alone, I am not letting you off of the hook; seriously consider buying more than one microphone. Buy a high quality, reputable brand of sound mixer and quality lavaliere microphones, buy the best cables and headphones you can afford. 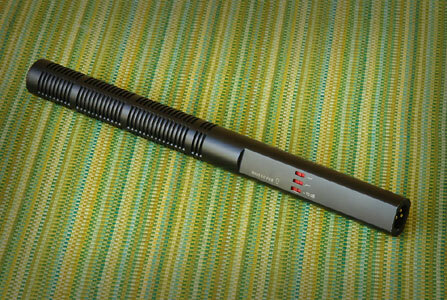 But most important of all, buy the right shotgun/cardioid variant microphones. Microphones as in plural. Your completed film/video projects will be judged mostly on audio. From a technical and audience viewpoint, great graphics, cinematography, story, actors and direction are all trumped by the quality of your sound. Creating great sound takes knowing how to choose the correct microphones and having access to the right microphones to record your location sound. I make no claim that the eleven microphones tested here should be the only microphones that you consider. There were many other candidates that I would have liked to have tested and written about. I tried for months to obtain a factory sample Sennheiser MKH-416 but Sennheiser could not provide me one. I tried for months to obtain samples of the Blue Line from AKG but they could not provide factory samples. Since I wanted the test to be as fair and unbiased as possible, I decided not to rent or borrow samples, I felt that would not be fair to the manufacturers or to you. We would have no way of knowing if a rental or borrowed sample had been abused, how old it was, etc. So I decided only to test factory fresh samples direct from the manufacturers. Unfortunately, the realities of time, and the space allotted for this article prevent me from not expanding these eleven microphones to forty or fifty models. I do feel that the microphones included are a good cross section of the most popular microphones for most users in the U.S., I do know that in other parts of the world, there are some popular brands not represented here.Since I am based in the States, it made sense to include the most popular brands that are easily�available in the U.S. and known in the U.S. The important thing to remember is that by reading this article and listening to the samples, you can train your ear and increase your knowledge of what you like and dislike in microphones. 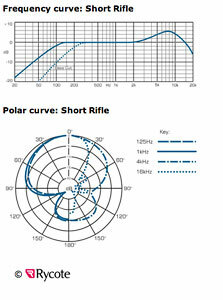 You can use this knowledge in the future when you consider buying any type of microphones. Sound is sound and high quality recording will become easier for you to recognize after you read through this article and analyze the sound samples. The microphones are listed in alphabetical order. Audio-Technica's AT875R is designed for video production and broadcast (ENG/EFP) audio acquisition. 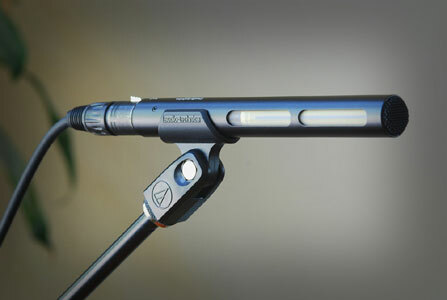 Audio-Technica's shortest shotgun microphone, it mounts conveniently on a HDV/DV or HD camcorder without adding noticeable heft, and is ideal for use with compact digital cameras. 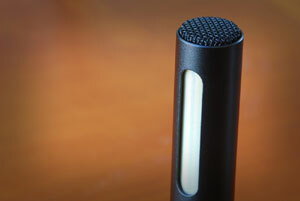 This high-performance microphone offers a narrow acceptance angle of line + gradient design. It also features smooth, natural-sounding on-axis audio quality and excellent off-axis rejection of sound arriving from the sides and rear of mic. I first heard about the AT875R at NAB 2007. The niche that Audio-Technica seems to be trying to fill with the 875r seems to be the camcorder mounted short shotgun. It's small, inexpensive and seems to be a perfect candidate for on-camera use. Except that you should know that mounting a microphone on your camcorder, no matter how good-sounding the microphone, is a recipe for horrible audio quality. We are more interested in how the AT875R performed as a proper boom mic. The AT4073a sets new standards in small size and light weight. With an overall length of just 9.13" and weight of just 4.0 oz, the mic adds virtually no heft to the end of a fish pole or the top of a minicam. 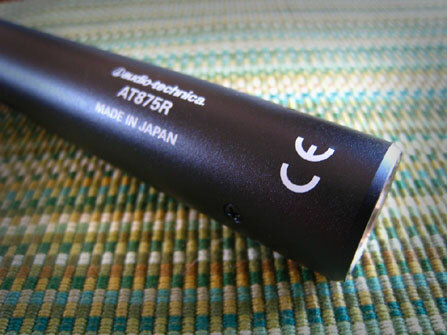 Through the use of an advanced, propriety Audio-Technica design, the interference tube of the AT4073a provides a narrow acceptance angle that would require a tube 50 percent longer using conventional technology. 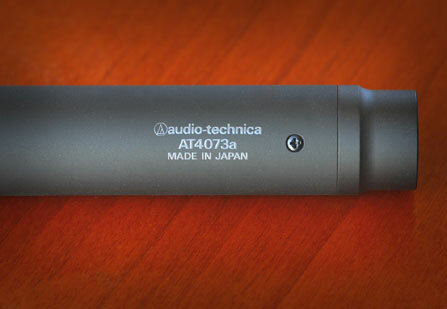 Audio-Technica has pioneered a unique interference tube design* in the AT4071a and AT4073a shotgun mics that provides the same directivity as mics up to 50 percent longer. I have quite a bit of experience in shooting with this microphone as a production company I shoot a lot for has them in their audio kits that I have used for the past few years. I have always liked the sound of the microphone, it is quite good for interiors, especially dead-sounding rooms with a lot of carpet and plush furniture. 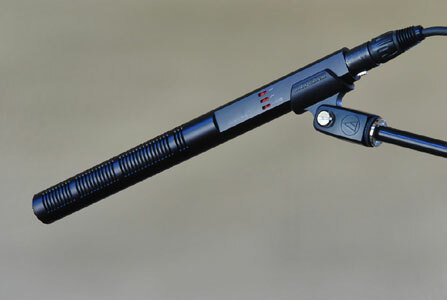 The rugged and lightweight MC 836 shotgun microphone has been designed to meet the demands of ENG and EFP applications. Due to its acoustical characteristics it is also suited for film applications. 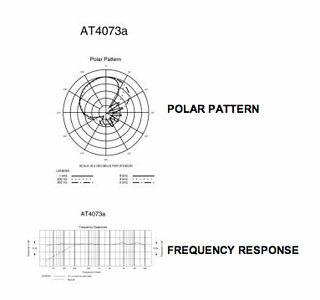 The directional polar pattern helps to suppress lateral and background noise.The microphone operates according to the pressure gradient/line transducer technique. 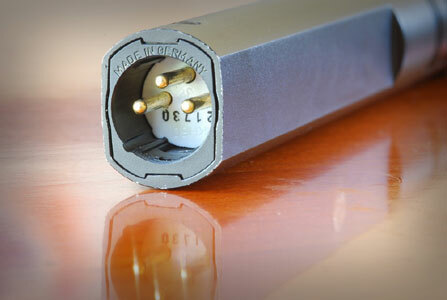 A switchable low frequency roll-off eliminates unwanted low frequencies at a cut-off frequency of 90 Hz. An integrated footfall sound insulation avoids the transmission of noise below 40 Hz. To avoid wind noise when used outdoors, a wind shield must be used. The microphone can be operated with a phantom power supply of 11 - 52 V.
I had never used a Beyerdynamic microphone before this review. The microphone's overall sound was neutral and it featured very good off-axis noise rejection. 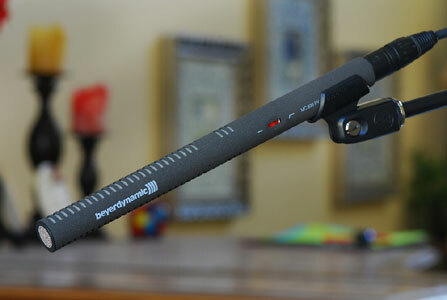 For some reason, Beyerdynamic mics have never been commonplace in video/film production and I am not sure why. I was eager to hear how this microphone compared to the brands more familiar to me. 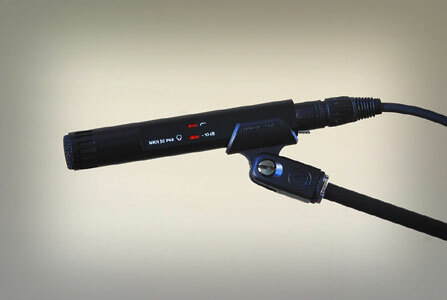 The KMR 81 is a shotgun microphone with a high directivity that remains within the acceptance angle independent of the frequency. The advantage is that a sound source, for example an actor on stage, will not change its apparent tonal balance when moving within this area. 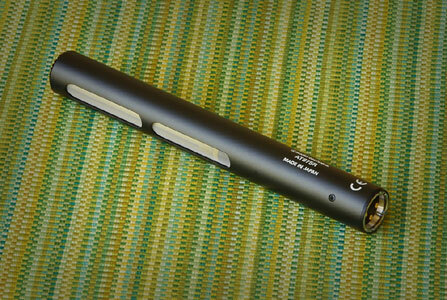 The KMR 81 is a shotgun microphone with a very directional characteristic. 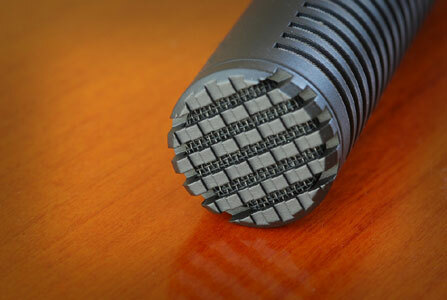 The microphone capsule is positioned inside a housing tube that is acoustically open but has a high flow resistance. The directional pattern of the microphone is lobe shaped. The attenuation of lateral sound is practically independent of the frequency. The KMR 81 has a frequency independent directivity within a pickup angle of 90� for audio signals that determine the tonal balance of the program material. Dan's initial take on the microphone: I have owned a couple of Neumann's large diaphragm studio condenser microphones for decades and have always liked their sound characteristics as well as their legendary build quality and craftsmanship. 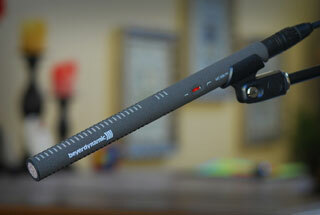 The KMR81i is no different; it's a very well crafted piece of gear. This microphone was the only nickel satin finish microphone we received for testing, which cosmetically makes it really stand out in a sea of black, gray and bronze finishes. The sound is smooth and natural and the KMR81i has outstanding off-axis noise rejection as well. The KMR81i has a very well balanced and clear sound quality that I found appealing. 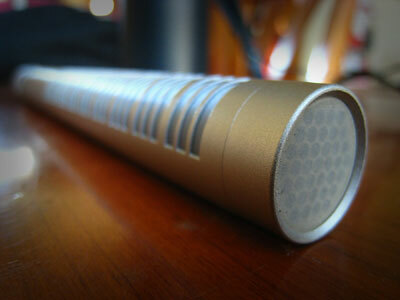 The MK-012 is a compact, high quality capacitor microphone. The wide, flat response ensures that all sounds are captured with a high degree of accuracy. 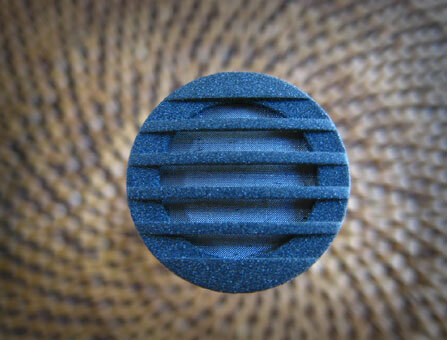 A cardioid, omni & hypercardioid capsule increase this microphone's versatility. 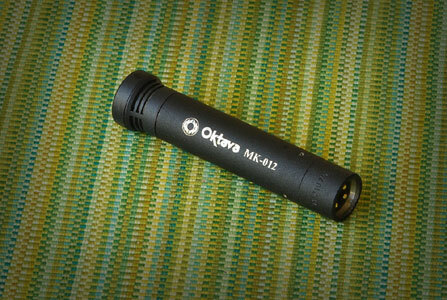 The Oktava MK-012 has become a cult microphone with location sound mixers, indie filmmakers as well musicians and studio owners everywhere. The microphone is priced in the low-budget range. Is this the only reason for all of the enthusiasm? I have heard comparisons between the MK-012 and the Schoeps microphones and I have also heard that the Oktavas are also prone to Q/C issues and excessive handling noise. The samples I recorded will let you make up your own mind about the Okatava. Personally, I found the microphone to have very good quality sound for its price range. The Oktava, to my ears, presented a slightly more colored and high frequency emphasized sound quality than the Sankens and the Schoeps, it did not have the smoothness and natural sound quality of the Schoeps but it did sound very impressive. I would not hesitate to recommend the Okatava as a solid, low cost and versatile choice that is an excellent value since it is a microphone system for under $400.00 including three capsules and a -10dB pad, microphone holder and case. I very much enjoyed recording with the Oktava, it seemed like a relative bargain. The new CS-1 Short Shotgun Microphone employs the same innovative technology as previous Sanken mics in a new, smaller, ultra-compact housing. Specifically designed for the film and television industries, the CS-1 is unobtrusive and easily avoids the camera's view. Sharp directivity delivers highly targeted sound while eliminating background noise through off-axis rejection. 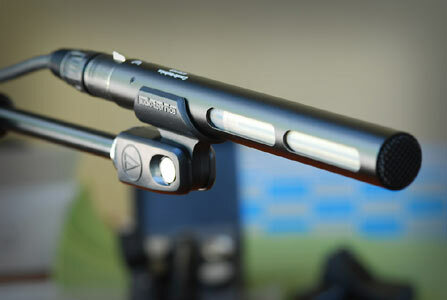 Measuring only 7 inches in length, the CS-1 is ideal for mounting on video and film cameras, and with a weight of only 3.5 ounces, it is easy to maneuver on boom poles and is also effective as a handheld shotgun mic. 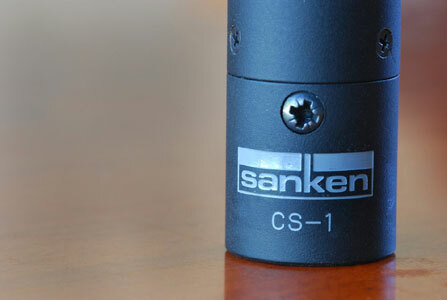 Utilizing Sanken's original square condenser capsule, the CS-1 has a flat frequency response well beyond 20kHz. The Sanken CS-1 has become a very popular choice as a solid mid-range and physically small short shotgun. With crisp detailed sound and very good off-axis rejection, the Sanken is an intelligent choice for a sound package for video/film. The sound is neutral, relatively uncolored and contains a lot of detail, particularly in the high frequencies. Sanken description of the microphone: In the CS-3e, three directional capsules are arranged in a front-back array to combine line microphone performance and second-order pressure gradient response in a single system.With this unique design, the CS-3e achieves phenomenal supercardioid directivity in the lowest frequencies and throughout the full range in a microphone 27cm (10 inches) in length. It is significant that the CS-3e picks up the targeted frontal sound sources with exceptional clarity over a wide frequency range - even in noisy ambient environments or in long reverberation spaces - by rejecting undesired noise and sounds coming from the rear and sides. 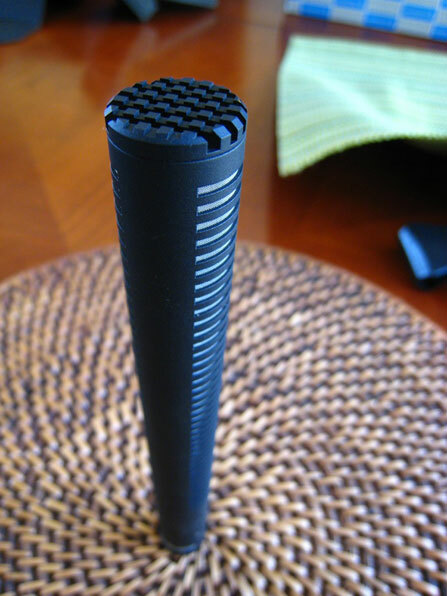 Conventional shotgun microphones use a line capsule array and a pipe with slits in front of the capsule to create high directivity by utilizing phase interference inside the casing. With this conventional design, high-directivity in the middle-low frequency range is not achieved, although high-directivity in the high frequency range is maintained. 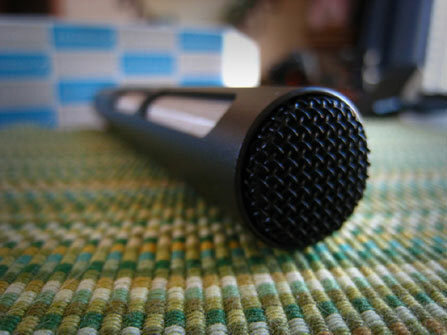 Conventional shotgun microphones are at a disadvantage because they invariably pick up unwanted sounds coming from the back and sides. 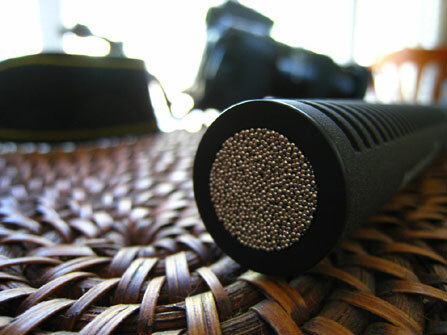 In order to solve this problem, conventional shotgun microphones designed for high directivity in the middle- low frequencies require a length of more than one meter (39 inches) in length. 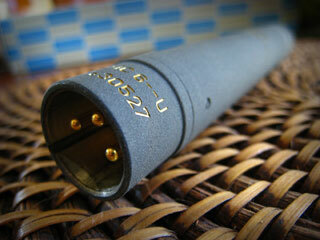 However, long shotgun microphones seriously affect mobility and are not ideal for field recording. The remarkable performance of the CS-3e is based on the combination of a second-gradient and line microphone with three directional condenser elements, using new PPS (Poly-Gold-Phenylene Sulfide) diaphragms to provide optimum humidity/temperature stability. The CS-3e incorporates the revolutionary technology of the CSS-5 shotgun stereo microphone (switchable shotgun stereo/mono/wide) and the COS-11s lavalier microphone developed in conjunction with NHK. The CS-3e is small and lightweight with a low-cut switch to satisfy the various needs of location and studio recording.The standard 19mm diameter permits use of a wide range of accessories developed for enhanced performance and field mobility. When a conventional shotgun microphone is near the sound source, proximity effect results in a boosting of certain low frequencies and slight masking of others. Some designs utilize this effect to reduce surrounding noises, but microphone response greatly varies with the changing distance between the source and the microphone. This effect becomes more pronounced when the directionality becomes greater. By contrast, the CS-3e virtually eliminates the proximity effect and maintains sharp directivity, while the sonic characteristics do not change with varied distances between sources and microphone. This is a significant advantage over all other directional microphones. The Sanken CS-3e presents somewhat of an enigma to me. It has a similar sound to the Sanken CS-1, but it has better off-axis rejection than the CS-1, as you would expect. 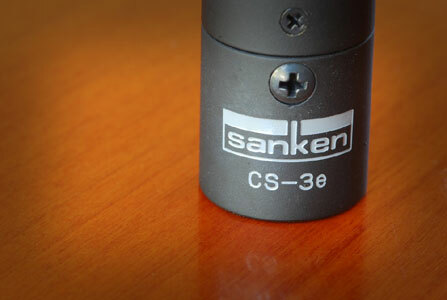 The Sanken CS-3e seems to offer a very smooth and detailed sound with excellent dynamic range as well. The CS-3e retails for almost twice the price of the CS-1 though. In audio, there is a general guideline for gear called the law of diminishing returns. What it means is that in order to obtain a piece of gear that sounds good, you have spend a certain amount of money. In order to obtain a piece of gear that will sound 10% better than a similar piece of other gear, you often have to spend many times as much. As costs increase, the differences in sound quality become smaller and smaller. I wonder if this might be the case with the CS-3e? It sounded smoother and more balanced than the CS-1 but is it worth almost twice the money? You will have to judge with your own ears and make that decision. The MK 41 is strongly directional. Sound arriving from off axis is attenuated even more than with a cardioid. 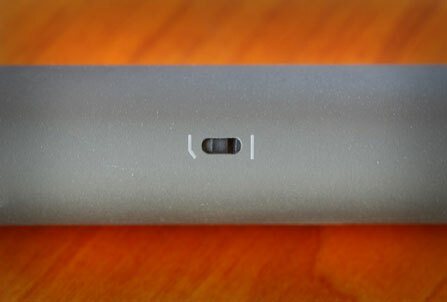 The pickup is 'drier' and less susceptible to acoustic feedback than any other SCHOEPS microphone type, provided that a loudspeaker is not located directly on the rear axis of the microphone. Its directivity is highly independent of frequency, so that even sounds arriving off axis and reverberant sound are registered without coloration. Consequently, even distant placement of the microphone produces a very natural sound pickup. This is a real advantage over interference-tube "shotgun" microphones, whose directivity is very frequency-dependent exceeding that of a supercardioid only at higher frequencies. 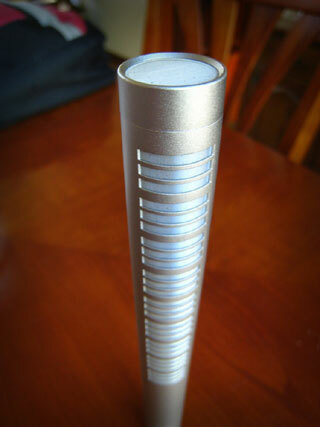 Interference-tube microphones are notoriously sensitive to their position in a room, where the shifting patterns of reflections cause corresponding shifts in sound color. Thus the MK 41 and CCM 41 are surprisingly effective and space-saving alternatives to shotgun microphones - and being small, they can often be placed closer to the sound source. The Schoeps CMC641 is an industry standard. It is relatively costly, yet most location sound mixers feel that it is worth it. To my ears, the CMC641 seemed to have the least colored, most natural sound of any of the microphones tested. It's difficult to describe. Almost all of the mics tested had clear and concise sound, yet I always formed the impression that I was listening to a recording of the sound. The other mics "present" the sound, each in their own style. With this microphone, I never got the impression that the sound was "presented" it just was "there" and sounded very similar to what my ears alone hear. In audio parlance, this is the textbook description of "uncolored" sound. The versatility of the Schoeps Collette System should also be considered. With the addition of other capsules, your CMC6U preamp becomes the basis for a very versatile and high quality microphone system, if you have the financial means to afford the not so inexpensive prices for additional capsules. 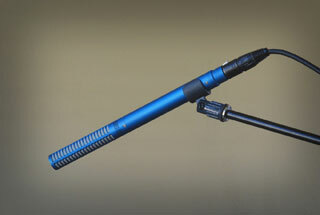 Schoeps Microphones and proudly present the Schoeps CMIT 5U shotgun microphone. 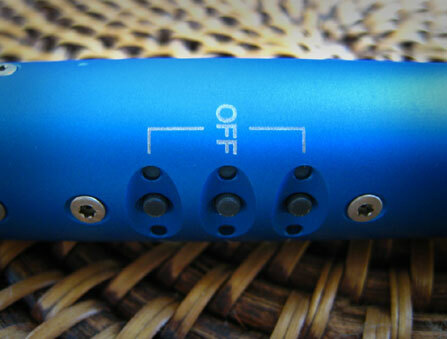 A pair of LEDs next to each filter pushbutton indicates the status (in/out) of each filter-a practical feature that is truly unique for a microphone of this type. Weight: An amazing 3 1/8 ounces! The focus on outstanding high quality, reliability, and neutral, accurate sound has been the production philosophy of Schoeps microphones since 1948. The simple elegance and clever engineering of their products reflects a true passion for the art of microphone manufacturing and a tireless attention to detail. 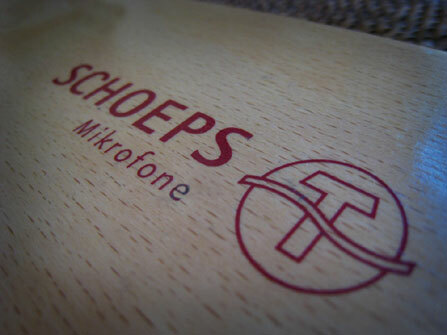 Schoeps is most famous for its Colette Modular Microphone System, the most extensive and versatile microphone system ever conceived. Introduced in the early seventies, the Colette System is still the heart of the Schoeps line today. 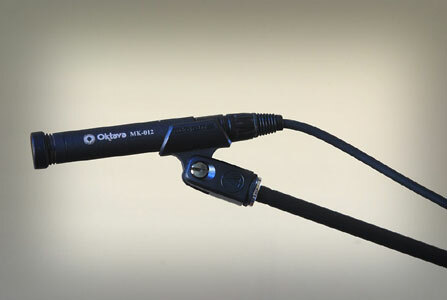 It was the first of its kind, allowing the use of various active accessories between the capsule and amplifier body and is undoubtedly the standard to which all other small-diaphragm microphones are compared. The CMIT 5U continues in this tradition of superb quality, innovation and functionality that all Schoeps products share. 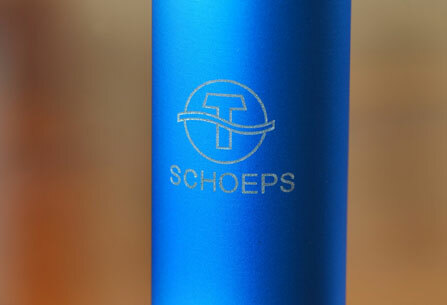 For years Schoeps has declined requests to produce a shotgun type microphone. The company felt if it were going to produce a shotgun microphone, there had to be some level of uniqueness and improvement. Besides the �ber-cool push buttons and LEDs, this microphone produces a natural sound not thought possible with an interference-tube design. It is only fitting that they are finally offering one since Schoeps' Technical Director Joerg Wuttke, the Project Manager of the CMIT 5U had studied with and assisted the inventor of the interference tube "shotgun" microphone, Professor Günther Kurtze. Countless location recordists already use a Schoeps CMC 641 supercardioid in conjunction with their favorite non-Schoeps shotgun to handle all their audio capture needs. For the first time, users can enjoy an audible cohesion between their venerable CMC 641 and their shotguns. Professional sound mixers have longed for a Schoeps shotgun for quite some time and the introduction of the CMIT5u finally means that a Schoeps shotgun finally exists. The CMIT5u sounds great and shares a lot of the same sound characteristics as the CMC641 supercardioid while featuring a narrower pickup pattern with better off axis rejection. Pairing a CMIT5u with a CMC641 would result in an ideal location sound package. The only problem for many of us might be that the cost of the two together approaches U.S. $3,600.00. The CMIT5u is a beautiful microphone that exudes a unique look and feel as well as a unique sound. The other notable quality of the CMIT5u is it's amazingly light weight. When using the CMIT5u, its extremely light heft allows the boom operator to use the mic for longer periods of time with less fatigue. Those missing few ounces make a big difference when using the mic on a long boom pole especially. Fit and Finish: Very nice black metallic finish with typical Sennheiser high-quality feel. The super-cardioid MKH 50 offers a higher attenuation of diffuse-field and lateral sound than the cardioid microphone. It is principally designed for use as a soloist's or spot microphone for applications requiring a high degree of side-borne sound muting and feedback rejection. 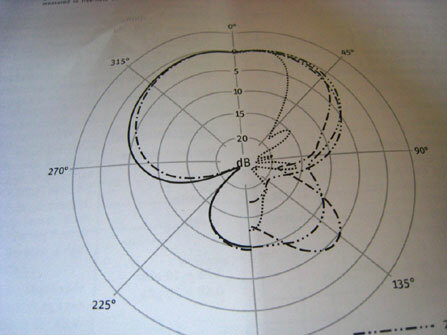 The directional characteristics are frequency-independent. The unit shall be a super-cardioid studio directional microphone with switchable pre-attenuation and switchable roll-off filter. The frequency response shall be 40 Hz-20,000 Hz, with sensitivity (free field, no load) of 25 (8) mV/Pa �1dB at 1 kHz. The nominal impedance shall be 150 W, and min. terminating impedance shall be 1000 W. The dimensions shall be .98 x 6.02 inches, and weigh approx. 3.5 oz. The unit shall be a Sennheiser MKH 50. Values in parentheses with attenuator switched on (-10 dB). 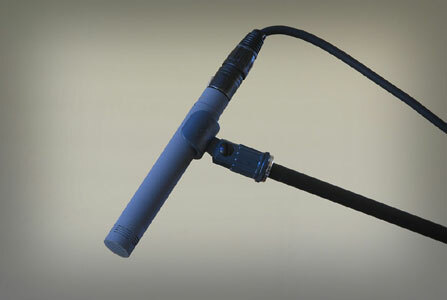 The Sennheiser MKH-50 is a popular supercardioid microphone. It has a robust and clear sound with a nice bass response and decent off-axis rejection. The Sennheiser has a different sound than the other high-end microphones tested, which I found refreshing. To my ears, the Sennheisers present a slightly "darker" sound with considerable low end without boominess. I find this sound appealing for many projects and subjects. 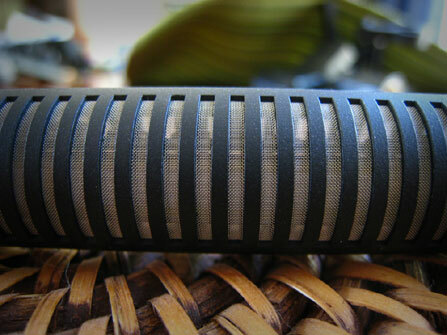 The Sennheiser MKH-60 is a very popular supercardioid patterned shotgun microphone. It has a robust and clear sound with a nice bass response and excellent off-axis rejection. The Sennheiser has a different sound than the other high-end microphones tested, although the basic sound quality is similar to the MKH-50, which I quite liked. The MKH-60 presents with less bass and slightly more mid-range emphasis than the MKH-50. It seemed that the most useful way to test these microphones was to record a variety of subjects in varying "real" audio environments using both male and female voices. Many of the other tests clips from microphones of the web were recorded in a perfect sounding VO booth or recording studio. This is fine if you record in a VO booth or recording studio but most video and filmmakers record in a wide variety of locations, from sound stages to living rooms, from street scenes to backyards, so I decided to try to record at least most of the test clips in "real" environments. I decided to record the samples with practical, common support gear. Most video shooters and an increasing number of filmmakers do not record dual system sound or use a Zaxcom Deva, etc. Most video and an increasing number of HD films are shot with the microphones input directly into the audio connections on the camcorder. Depending on the model of camcorder, most HD/HDV camcorders are capable of recording decent quality sound. I decided that I would run the signal through an audio mixer, then I would run line level output from the audio mixer to the line level inputs of the camcorder, bypassing the camcorder's mic-preamps. NTSC Panasonic HVX-200 P2 camcorder. Camera was set to record 48kHz/16 bit audio in the 720 24PN frame rate to P2 cards. All footage was loaded into Final Cut Pro 5.1.4 and .AIFF files were extracted. The .AIFF files were then compressed to 192Kbps .MP3 files for publication on the web. This type of prosumer camcorder is a very common for many shooters today, although many also shoot HDV tape. Each microphone was fed into audio input one and two, with a roughly 15dB offset. Only one channel was used for the audio samples for this article, the single channel was duplicated to for those listening to this with a stereo speaker set on the computer. Left and right channel are identical. Professional Sound Corporation M4 MKII Audio Mixer. The PSC audio mixer supplied 48v phantom power to all of the microphones in the test. The M4 sent a line level output signal to the HVX-200. To be honest, if you listen to the sound samples I have provided on average computer speakers or especially laptop speakers, you are not going to hear very many differences in the samples. Many of the differences between all of these microphones are in the very low frequency range and many of the differences between the different microphones are in the very high frequencies. Simply put, low quality gear is not capable of reproducing very low or very high frequencies with much accuracy. I analyzed all of these test clips on a playback system in a sound treated room through Genelec 1029a studio monitors with a Genelec 1091b subwoofer. The system and room have had spectrum analysis and the room has been EQ'd and tuned. I suggest that, if you want a fair evaluation of the clips, you need to obtain playback on a decent quality, somewhat accurate playback system. If you do not have access to a decent quality playback system, listen to the samples on decent headphones. The signal will not be accurate but you will at least be able to hear the differences between the mics, the low frequency differences and the room tone and air tone, ambient sound differences. I tested these samples on my laptop speakers and on some cheap computer speakers and trust me, all of the mics sound almost the same on lousy speakers. This test was designed to reproduce a typical interview setup. The room was a small office measuring 22' long by 14' wide with an 8' ceiling height. The room contained a nominal amount of furniture, a carpeted floor and one window. I have shot hundreds of interviews at corporations, movie studios and offices suites in rooms very much like this one. The microphone was placed about a foot over the subject's head on a stationary microphone boom. I did not want to color the sound by using a windscreen or pop filter so for the interior tests, all of the microphones were recorded bare with only the mic element facing the subject. For this test, listen for the differences in the quality and timbre of the voice, noise levels and room reflections. For the microphones that had built-in low frequency roll offs or cuts, I recorded separate clips with the microphones low cuts switched in and out so that you could compare each of the microphone's rumble and noise level. All audio files are 192Kbps .MP3 files. On Mac-based systems, if clicked on, these files will open in iTunes. On Mac-based systems, I recommend downloading the files, then opening them with QuickTime player for a more accurate playback. On PC systems, these files may be played back with iTunes player or any other .MP3 capable application. You will notice that each sound file below includes the letters "MVINOA" in the file name. MVINOA stands for Male Voice Interior On Axis. I have tried to name each file with a unique set of initials so that if you download several, with a glance, you can tell which tests for which microphone you are listening to. I was pleasantly surprised after recording the first test with this microphone. I tried to forget everything that I knew about each microphone and just listen. When I listened to the Audio-Technica AT875R, I really liked what I heard. The mic features strong bass response with a good mid-range and fairly detailed high end without being overly sibilant. Overall this microphone had a balanced sound. A production company that I often shoot for uses these microphones so I was instantly familiar with the sound signature of this mic. One standout characteristic of this microphone is that it has a very high nominal output; it was significantly more sensitive than any of the other mics. The microphone emphasizes highs more than most of the other mics that I tested. The microphone's bass roll off was also very effective and more drastic than some of the other mics tested. I would characterize the 4073a sound as "in-your-face", it would be good for quiet subjects or in situations where you could not place the microphone very close to the talent. Overall this microphone emphasizes the high frequencies. I have never used a Beyerdynamic microphone before this test and I was impressed with the smooth and natural quality of this microphone. 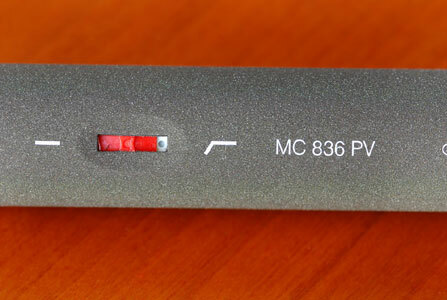 The MC-836PV emphasizes more of the mid-range sound of voices than some of the other mics tested; it also retains smooth highs and a decent amount of bass response. Overall this microphone seemed to emphasize the mids. It is the opposite of the AT4073a and MKH-50; it is kind of mellow sounding and seemed to be fairly uncolored. The Neumann is certainly an impressive looking and well-crafted piece of gear. 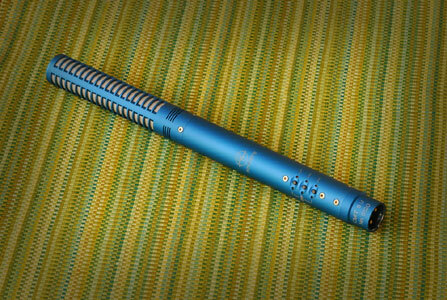 I own several Neumann microphones although I have never used a Neumann shotgun before. This microphone had a very well balanced sound that I would mostly describe as smooth. There is a quality to the sound that is hard to describe, but I can relate it to how it makes my voice sound. On many of the other microphones, I hear a lot of effort in my voice. I am not a professional VO person or actor so I am sure that my breathing is not correct for VO work. In many of the other microphones, I can hear the strain in my voice that I did not hear in the Neumann. With the Neumann, my voice sounded more natural, yet the sound was still exciting and dynamic. Overall this mic did not seem to overly emphasize any frequency range more than the other. 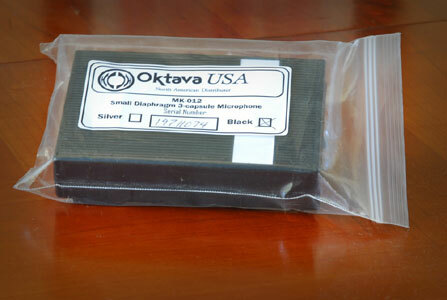 The Oktava was another "underground" microphone that I had heard a lot about but had never used. The sound overall was very nice although I preferred the sound of my voice with the hypercardioid capsule to the cardioid capsule. The sound was smooth and balanced although I did detect a tiny bit of emphasis on sibilance but really not enough to be concerned about. The microphone does pickup a very impressive amount of detail without over emphasizing plosives or mouth sounds. I can see why there exists a large and enthusiastic following for this mic, it is a great sounding unit. Overall this mic seemed to slightly emphasize mid-range. The CS-1 is another microphone that has received a lot of notice from video and film people as well as professional mixers. In listening to the first test, I am struck by how crisp and detailed the sound is. This microphone picked up every last detail in my voice yet I did not hear anything unpleasant in my voice characteristic, no excess sibilance or mid-range distortion. The microphone seemed to not pickup a lot of bass or rumble in the room. Besides the Audio-Technica AT4073a, this microphone struck me as one of the most detailed, yet this microphone seemed to have a smoother all-around sound overall than the 4073a. Overall this microphone seemed to emphasize the highs and detail. 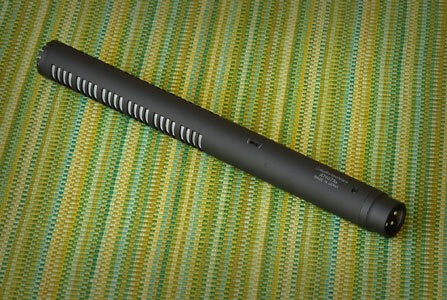 The CS-3e is Sanken's more expensive, physically longer shotgun microphone. In A/B comparing the CS-3e and the CS-1, I hear more smoothness and more bass from the CS-3e. The two mics share a similar basic sound characteristic but the CS-3e overall sounds smoother to my ear. The CS-3e seemed to be one of those rare microphones that can reproduce a lot of bass without too much rumble or undesirable room tone. 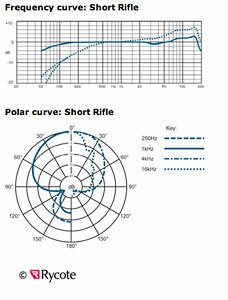 As expected, I detected less off-axis noise from the CS-3e than many of the smaller and shorter microphone designs. The Sanken seems to have some of the same hard to define balanced quality that the Neumann KMR81i has, which is a very nice characteristic that makes the mic a pleasure to use. Overall this microphone seemed to slightly emphasize mids and bass. Ever since I have been involved with sound for picture, a recurring microphone seems to come up in conversation, the Schoeps CMC641. At first listen, you are not blown away by how amazing the mic sounds. I learned a long time ago that with microphones and audio monitors, "sounding good" is not really that desirable. "Sounding accurate" is a much more desirable characteristic and that is what I get with this microphone on my voice. All of the other microphones in the test gave me various versions of my voice, most sounded very nice but all sounded like very good copies of my voice, some with more bass, some with more highs but the Schoeps simply recorded my voice exactly as I hear it in my head. I don't sound great on it, but I can't deny that it is the most accurate. This is the reason why most sound mixers will drop the $1,592.00 that it takes to buy one. The Schoeps did not seem to really emphasize any particular frequency range. Very impressive performance if you know what you are listening for. By all accounts, recording an interview in a relatively small room with low ceilings and mostly hard surfaces with a shotgun shouldn't sound that great. I was impressed with the sound quality of this microphone. 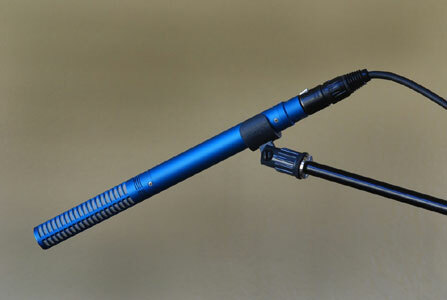 It is an unusual looking microphone, very high-tech with glowing LEDs, active switches and a visually arresting anodized blue color, but the microphone delivered great sound with a lot of adjustment that most of the other microphones tested could not match. This microphone sounded different than the CMC641, yet somewhat similar in the overall quality. It sounded as if material recorded with this mic would successfully intercut with material recorded with the CMC641. I felt like this was the only microphone I tested that really could sound like two or three different microphones without switching capsules. Very impressive, smooth and detailed sound with that elusive "shimmer" that only very expensive microphones seem to record. Overall this microphone emphasizes bass frequencies. The MKH-50 was a different animal. I very much liked its sound quality. If all of these microphones were described in movie genres, I would characterize the sound of the MKH-50 as "action movie". The microphone seems to record a sound that kind of jumps out of the speakers, almost with a slightly compressed quality that would work very well for a lot of situations. Often during the video and film post process, sound has a tendency to become flattened so that the end result needs a lot of post processing to sound exciting. If you record using the MKH-50, your sound will already sound as if it is very dynamic and has a lot of energy. The mic seems to equally emphasize bass, mids and highs. The microphone has a lot of fans and after listening to this test, I can see why. As I listened to the MKH-60, I sensed a lot of balance in the sound. Just as in the Schoeps CMIT5u, the MKH-60 sounded surprisingly good in a small room with lots of reflective surfaces. I would characterize the sound of the MKH-60 as mid-range emphasized whereas the MKH-50 seemed to be much more bass focused overall. The MKH-60 is a favorite for newer boom operators as it's pickup pattern is pretty forgiving yet has good rejection of off-axis noise. Like the MKH-50, the overall sound quality of the MKH-60 is darker than many of the other mics tested, one more reason why it is important to have more than one microphone in your sound kit. Sometimes your talent can sound kind of high frequency or even chirpy. Recording that sort of voice through a mic that emphasizes high frequencies can be a mistake. A microphone like the MKH-60 can do very good things for thinner sounding and female/kid voices, as it lends then some richness. I would say that overall the sound of the MKH-60 leans toward the mids. This test was recorded in the same location as the first test, the difference being that I moved the subject away from the microphone during the recording. The first sound you hear in each clip is the same as the first test, male vocal, on-axis but the subject then rotates away from the microphone axis by about three feet at about a 45-degree angle from the microphone. The idea behind this test was to listen to how the microphone rejects off axis noise. Universally all of the microphones claim to have great off-axis rejection so this test was designed to let you hear how each mic sounds under identical circumstances and judge for yourself. 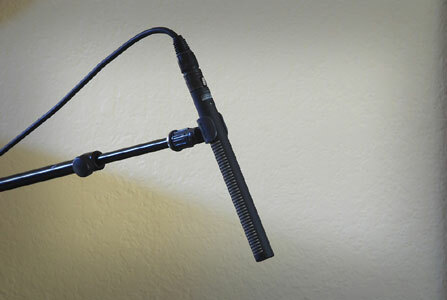 The microphone was placed about a foot over the subject's head on a stationary microphone boom. The subject then rotated about 3 feet away from the microphone. For this test, listen to the amount of off-axis rejection. For most needs, the more off-axis rejection the microphone has, the better sound you will record in most non-studio environments. Don't only listen to the sound level of the off-axis sound; also listen for the sound frequency response as the subject rotates away from the mic. Some of the microphones pickup all of the frequencies equally in their off-axis response, some only pickup lows, mids or highs off-axis. You will notice that each sound file below includes the letters "MVINOFFA" in the file name. MVINOA stands for Male Voice Interior Off Axis. I have tried to name each file with a unique set of initials so that if you download several, with a glance, you can tell which tests for which microphone you are listening to. The AT875R had decent off-axis rejection, but it was not as effective as any of the longer shotguns in this particular test. As I rotated away from the mic, the sound level did drop noticeably but I also still hear quite a decent amount of high frequency content in the off-axis sound. Not a bad result, especially for such an inexpensive mic but not on par with the more expensive mics. The 4073a had better off-axis response than it's little brother, the AT875R. I was interested to hear what the off-axis sounded like since this microphone seems to emphasize the high-end more than most of the other mics tested. Surprisingly, the highs seemed to fade away more than I anticipated they would. While the 4073a did not have the best off-axis response of all of the mics tested, it did pretty well. To my ear, after A/B comparing all of the microphone's off-axis response, the Beyerdynamic seemed to have almost identical off-axis sound as the AT4073a. I find this interesting because overall, the MC836 has a much more mid-range emphasized sound while the 4073a emphasizes the highs. 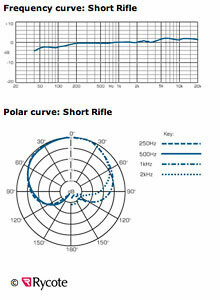 The off-axis response on the KMR81i was quite good. It was interesting that on this microphone, none of the frequency response seemed to change off-axis; the signal just lowered considerably as the sound source moved away from the mic. I would still characterize the off-axis sound as smooth, just as the mic's on-axis response is. This is all the more impressive when you consider that I recorded the test in a room that really should not have sounded very good with shotguns. Impressive performance. I tested the off-axis response with both the cardioid and hypercardoid capsules. As expected, the hypercardioid provided considerably more off-axis rejection than the cardioid did. I did notice that the bass and highs definitely dissipated more than the mids did using the hypercardioid capsule. This was the only microphone I tested that seemed to actually change phase in the sound quality as I rotated away from the mic. 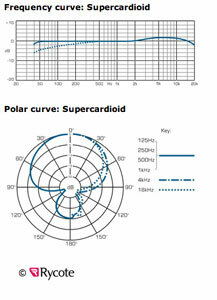 This effect was more pronounced with the hypercardioid capsule than with the cardioid. Overall, I was particularly impressed with the off-axis rejection of the hypercardioid capsule. The CS-1 seemed to provide decent off-axis rejection although it was not as effective as some of the other microphones tested. The quality of the sound did seem to mostly gravitate toward the mids as I rotated away from the mic, the highs and bass seemed to mostly disappear. This to me could mean that the Sanken CS-1 would be particularly good at rejecting non-voice sorts of sounds off axis but might not be the best choice for isolating a voice in a crowd of voices, for instance. The CS-3e proved that it's significantly higher cost than the CS-1 is justified when it comes to off-axis rejection. The CS-3e had very good off-axis rejection and the quality of the sound seemed to stay about the same as the source rotated off-axis. This microphone seemed to do quite well at off-axis rejection and I would place it amongst the best based off of my non-scientific, informal off-axis test. The CMC-641, to my ear, seemed to react in the opposite to the Sanken CS-1 as I rotated away from it. The mids seemed to disappear but I still heard a decent amount of bass and highs, Keep in mind that this microphone is a supercardioid, not a shotgun, so I did expect to hear less off-axis rejection as the shotguns. It would be a good idea to A/B compare this test with the other supercardioid that sells in a similar price range as the Sennheiser MKH-50. As I expected, the CMIT5u seemed to do pretty impressive things in this test. The off-axis rejection was amazing. My voice has a serious drop off in level, with an especially noticeable rejection of the highs and bass, while retaining slightly more of the mids. The CMIT5u keeps it's smoothness while off-axis, but the drop-off in level is abrupt, leading me to believe that you had better be a skilled boom operator if you use this microphone to boom mic multiple speakers. Based upon this test, I feel that CMIT5u was clearly the strongest in off-axis rejection of all of the mics tested. The off-axis rejection of this mic was quite good. Keep in mind that this microphone has a very punchy, in-your-face sort of quality so I was particularly interested to hear how it's off-axis response was going to come across. To me, the MKH-50 did not quite match the other supercardioid, the CMC641 in off axis response although it was very close. This could also be related to the relative sound levels of the samples recorded, the Sennheiser has a higher output than the Schoeps and I tried to match them in level. I felt that the off-axis rejection on the MKH-50 was very good but it still would not be my number one choice in the most noisy situations. I think that is a good indication that supercardioids and hypercardioids in general will not perform as well as shotguns when more isolation is needed. The MKH-60 seemed to do quite well in this test. Keeping in mind that it is a true shotgun, you would expect it to outperform the supercardioids and hypercardioids, and it did. The real question is how it performs against the other shotguns. In A/B comparisons with the Neumann KMR81i and the Sanken CS-3e, I noticed less bass and a little less mid range with the MKH-60 than with the Sanken or the Neumann. The MKH-60 did not have as much off-axis rejection as the Schoeps, though. Overall, I was very impressed with the sound of this microphone in this test. This test was recorded in a different, larger and deader room than first two tests were recorded in. This test was probably the least precise of all of the tests, mainly because I am by no means a professional boom operator. I do hand boom occasionally but my technique is fairly clumsy, especially when compared to a pro. The idea was to mount each microphone to a mount, mount the mic to the boom pole and to simulate miking a typical two-person dialogue scene where the mic is placed overhead and the boom operator quickly twists the boom pole to follow the conversation. I recorded the test with no actors so that you could clearly hear just the microphone's handling noise. 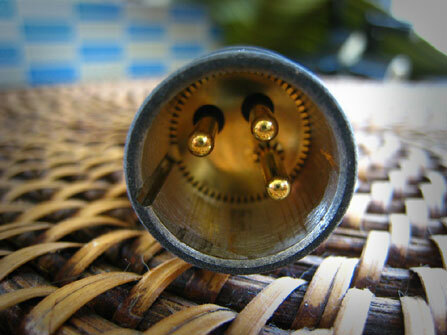 Certain microphones are said to be more microphonic than others. What this means is that the microphone amplifies all of the microphone's physical exterior noise, the noise of the microphone cable and various other handling noise. A microphone that is susceptible to handling noise may not be the best choice for a project with a lot of movement. Keep in mind, once again; this was a very imprecise test. All of the microphones exhibited at least a small amount of handling noise, while some exhibited quite a bit. A skilled boom operator can minimize the amount of handling noise so depending on who will be handling your microphone; this handling noise issue may or may not be a big deal. If you are amateur like I am, this test may be more significant than if you hire a professional boom operator. You will notice that each sound file below includes the letters "Handling" in the file name. Handling stands for Microphone Handling. I have tried to name each file with a unique set of initials so that if you download several, with a glance, you can tell which tests for which microphone you are listening to. I thought that the AT875R lived up to its claim of being designed for on-camera mounting. If you think about it, a microphone designed for on-camera use needs to be able to reject a lot of handling noise since riding around on a camera is somewhat similar to flying overhead on a boom mount. The initial clunk you hear is me picking up the boompole but once I had the mic in the air and was moving it from imaginary talent to imaginary talent, I noticed a touch of mid range noise but almost no low end rumbling. The AT875R turned in a very good performance in this test. It made sense to me that the AT4073A seemed to exhibit a bit more handling noise than some of the other mics in this test, particularly with low-end rumble. The AT4073a is a significantly more sensitive microphone than any of the others tested so this makes the presence of more noise understandable but not desirable. If you decide to hand boom with this microphone, I would hope that you are an experienced boom operator. In the hands of a rank amateur boom operator like myself, the results are not great. 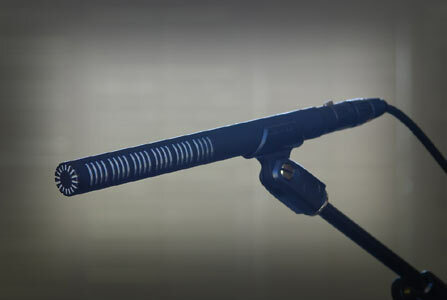 On the other hand, professional boom operators would probably enjoy the increased sensitivity of this mic; it would mean more leeway in having to place the mic element so close to the talent. This is a good sounding mic but very sensitive. I did get a better result using the mic's bass roll off. 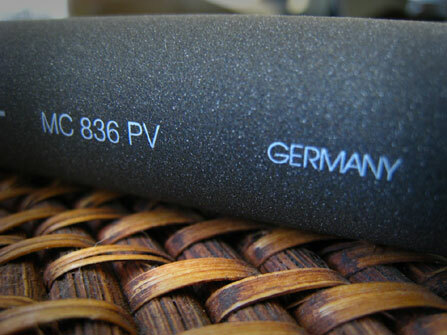 The Beyerdynamic MC-836 performed this test very well. There was a tiny bit of rumble but using the mics bass roll off could significantly reduce it. This microphones basic sound quality seemed to be neutrality so in the realm of handling noise, this can be considered a distinct advantage. Several of the other mics that emphasize a specific frequency range exhibited even more of the emphasized range when swinging around at he end of a boom pole. 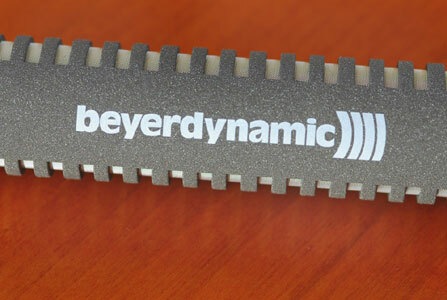 The Beyerdynamic MC-836 delivered a very good result in this part of the testing. The KMR81i offered an excellent performance in this test. There was a hint of bass rumble, but it seemed to stem almost more from the air rushing past the mic diaphragm more than from actual noise transmitted from the mount and boom pole and my clunky boom operating. I performed the mic handling test inside so I did not have any windscreen mounted. The relatively low handling noise exhibited would probably mostly be masked by dialogue and ambient noise in most cases and could certainly be compensated for by a more skilled boom operator. The Oktava MK012 was tested with the hypercardioid capsule, I felt that this would be the most commonly used capsule when using this microphone. I did notice quite a bit of handling noise with this microphone. I did test with three different mic mounts, just to make sure, but the Oktava did exhibit considerable noise with all three mounts, although I did notice that I did get a significant reduction in handling noise when I used a higher-end Lightwave mount that had rubber suspension legs rather than rubber band types of mounts. I don't feel that the handling noise is a deal breaker for the MK-012; it just means that you need the best microphone mount and the best technique. For those of you who plan on hand booming with this mic, practice, practice and if you can swing it, hire a skilled boom operator. The CS-1 seemed to work pretty well with hand booming. I did detect a tiny bit of rumble but not very much. Based upon what I hear from the tests, the CS-1 was in the top three in recording the least amount of handling noise. This was a very good performance from a mid-range priced microphone. For the CS-3e, I would take everything stated about the CS-1 and embellish on it even more. The CS-3e had exemplary low levels of handling noise, even when manipulated by my clumsy boom pole skills. An exceptional result in this test, very little noise was apparent. The Schoeps CMC641 had very, very low levels of handling noise. In order to even hear any of the handling noise, I had to really crank the levels of my audio system. There is a slight amount of bass rumble as I flipped the microphone from imaginary talent to talent but at normal listening levels, the noise was barely apparent. The Schoeps CMIT5u turned in an almost identical performance to the CMC641. Very little noise although the noise that was there was of a decidedly deeper frequency. This makes sense as the CMIT5u is much physically larger yet lighter in weight than the CMC641. I think the extra mass of the CMC641 probably absorbs more of the deep bass frequencies that are slightly more apparent on the CMIT5u Excellent handling characteristics. 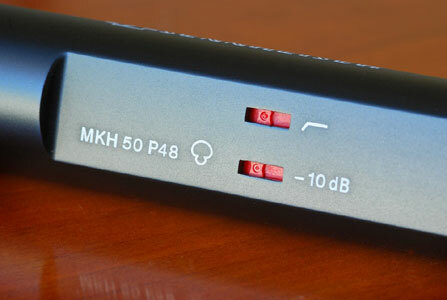 The Sennheiser MKH-50 also had very, very low levels of handling noise. I was able to determine that what little noise was apparent was of a pretty low frequency. 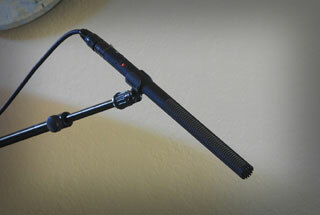 I used the included Sennheiser microphone mount with the MKH mics and it did a very good job. The MKH series mics are marked by an unusual rectangular shape so using this microphone holder is probably a good idea as the Sennheisers won't easily fit into a regular circular tube-shaped microphone mount. An excellent result from the very low handling noise of the MKH-50. The MKH-60 exhibited even slightly lower handling noise levels than the MKH-50. I used the same Sennheiser mic mount and obtained very impressive results. I would say that this would be a great mic to consider if you are an amateur boom pole operator and need a forgiving mic. The MKH-60 isolates you from the boom pole in a way that is very appealing. I felt confident that with this mic, I could actually boom operate and get decent results. That's saying a lot. This test was recorded in a fairly lively room that measures 30' by 22' with a 12' ceiling. I felt that it was important to record sound using a female voice because microphones are often sexist. What I mean by sexist is that often a microphone that makes a male voice sound great will often sound thin on a female voice and vice-versa. I actually recorded some footage using each of the microphones for a documentary project in progress so you can hear the microphones at work in a genuine sort of environment. For this test, listen to the voice quality of the talent, listen for thinness or thickness in her voice along with all of the usual room reflections, rumble and off-axis noise. You will notice that each sound file below includes the letters "FVINOA" in the file name. FVINOA stands for Female Voice Interior On Axis. I have tried to name each file with a unique set of initials so that if you download several, with a glance, you can tell which tests for which microphone you are listening to. I liked the way the AT875R rendered the talent's voice. It had a crisp, clear quality that I find appealing. That said, there is a slight touch of sibilance if you listen to her S sounds. Overall, I would have no problem using this microphone to record a female talent; I thought the end result sounded good. I was surprised to hear the warmth that the AT4073a brought out in the talent's voice. 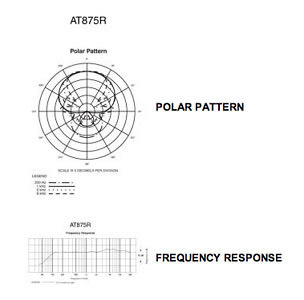 In A/B comparisons with the AT875R, the 4073a sounds warmer and fuller yet retains the crispness. I expected a thinner sound. Overall, I think that this microphone sounded better with the female talent's voice than with my own. Keep in mind that this is a shotgun on an interior. I heard no nasty room reflections or other anomalies that can sometimes show up when a shotgun is used in a medium-sized reflective surfaced room. This microphone sounded better than I thought it would in this situation. I thought that the Beyerdynamic MC836 had a pleasant mellow bass/mid-range emphasized quality to it. The mic was not as crisp sounding as some of the other mics but it did have an appealing smoothness that I only found in the other more expensive microphones. There were no problems with sibilance and overall, I thought that this microphone de-emphasized the mouth sounds (clicking, saliva/tongue sounds). A very nice sounding result. The Neumann had a precision to it's sound with the female talent. I almost had a sense that I was listening to a lavaliere. Even though the Neumann was placed the same distance as all of the other mics from the talent's mouth, the Neumann definitely sounded closer. This could be very desirable if you are shooting in real locations as noise from outside of the room will be minimized. On the other hand, to me, the sound could also be perceived, in this situation, as bordering on sterile. Some sound mixers like to hear a little bit more of the room characteristics mixed in with the voice, but it just depends on your preference. I felt that the KMR81i made the talent's voice seem appealing and I liked the sound quality overall. It is interesting to listen to the differences in this microphone when using the cardioid capsule versus the hypercardioid. The cardioid definitely has more emphasis in the bass frequencies but also more room tone. The hypercardioid capsule has less room tone but her voice sounds thinner with it as well. I thought the highs were pleasant all around and that overall, the microphone's sound with a female talent was a winner. The Sanken CS-1 had a sound with the female talent that I would describe as "intimate". Much like the Neumann KMR81i, the CS-1 had a very close-mic sound with the female talent in this room. The sound is very crisp and quite clear. I did notice more mouth sounds with this microphone than with most of the other microphones. I found the overall sound quality of the CS-3e in this situation to be quite good. The sound was smooth and the microphone had almost no issue with sibilance. The sound was more mid-range and bass emphasized, which for this talent's voice was a good thing. I felt that the Sanken made this voice sound friendlier and more relaxed. Much like the way this microphone made my voice sound completely neutral, the CMC641 made the female talent's voice sound very neutral to my ear. There was no excess sibilance and no distortion or room reflections that I heard. The output level with her voice seemed to be a bit lower than it was with my voice though. It might be just me, but I sensed more detail in her voice with the CMC641. Once again, I feel that this mic is probably the most "truthful" of the all of the mics tested. To me, the CMIT5u had the same basic vocal quality as the CMC641 but it had a fuller, more bass filled sound. I A/B tested the dialogue from the CMC641 and the CMIT5u and they would definitely intercut well. The CMIT5u has more presence than most of the other microphones but it is also smoother sounding that most of the others. An interesting thing, I heard more ambient sound in this room with this mic than I did in most of the others. I honestly think it was because of room reflections, not that the mic itself was picking up the ambient so much. I A/B compared the Sennheiser with several of the mics but I was most interested in hearing the differences between the MKH-50 and the Schoeps CMC641. They are similar mics in a similar price range. 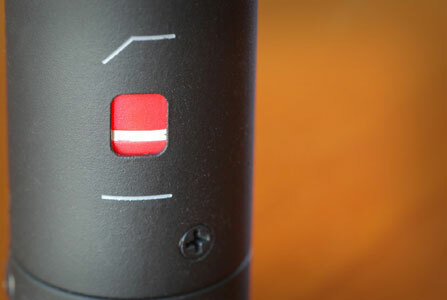 The Sennheiser has a darker, bassier and mid-range emphasized sound. I felt that the detail was about equal between the two and both sounded amazing. When it comes down to it, I think that anyone would be very happy with either of these; it mainly comes down to personal preference. The Sennheiser still comes across as more dynamic and exciting, while the Schoeps comes across as less colored. I liked them equally but for different reasons and would use either in certain situations; depending on what type of project it was and what quality I wanted in the sound. The Sennheiser MKH-60 is a great shotgun microphone. If you listen to the sample test, you will hear what I did, a great, full and rich sound on the female voice. I think that like the Schoeps CMIT5u though, the sound had some artifacts in it because of room reflections. In A/B comparing this mic with the MKH-50, the CMC641, the CS-3e and the KMR81i, I noticed that the MKH-60 sound field had a compressed quality to it. I attribute this to room reflections. The boom was located only about a foot beneath a low drywall ceiling in a medium sized hard surfaced room, not an ideal situation for a shotgun. While the sound would be totally usable, the MKH-50 and the CMC641, to me, sounded best in this room with this talent. I did not have a full crew to record all of these tests but I thought it would be valuable to shoot a "man on the street" sort of setup so that you could hear how the mics performed on semi-noisy exteriors. The tests were recorded in the evening so the ambient noise was not too high but there is definitely some ambient noise. Listen for off-axis noise like dogs barking in the distance, traffic noise (this was recorded about 200' from a busy street), airplanes and wind buffeting. Because this test was recorded outdoors, I enclosed each microphone in a Lightwave Systems Zeppelin, but did not use a fur windscreen cover since there was almost no wind the night these were recorded. You will notice that each sound file below includes the letters "MVEXOA" in the file name. MVEXOA stands for Male Voice Exterior On Axis. I have tried to name each file with a unique set of initials so that if you download several, with a glance, you can tell which tests for which microphone you are listening to. In this test, I was out in nature, so to speak, (well, actually my backyard). I was impressed at how the AT875R was able to reject most of the ambient street noise although you do hear the crickets more on this mic than on some of the others. The sound quality was balanced and I thought it made the quality of my voice appealing. This was not the best microphone for exteriors but I thought it would still be useful for exteriors if you were on a tight budget. Accurately judging the AT4073a outdoors was a tall order, mainly because of this microphone's extraordinary sensitivity. If I A/B between this microphone and the AT875R, this microphone seems to be picking up more ambient noise. But, in looking at the meters, I can also see that the signal that the AT4073a recorded at the same input levels was considerably hotter. If I compensate and lower the levels on the AT4073a, then the ambient level becomes closer in level to most of the other mics. This microphone would be excellent in picking up more distant subjects. If you can only get your shotgun perhaps 4-6 feet from a subject instead of a foot or two away, this microphone would pick up the sound better than most of the other mics in the test. The MC-836PV did a very nice job on the exterior test. It had excellent rejection of off-axis noise; I could barely make out the traffic din from a distant road. 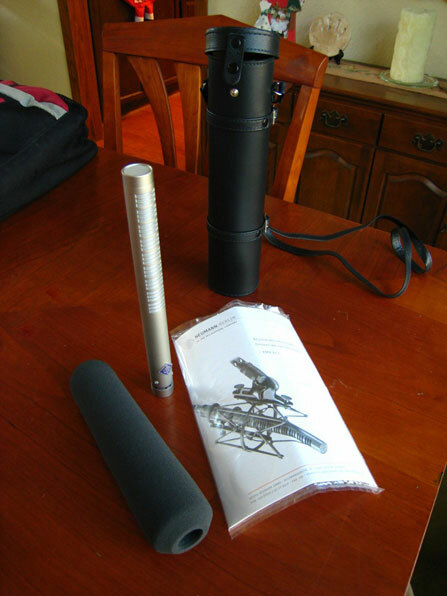 I could still hear the crickets/cicadas, but they were more muted than with some of the other mics tested. I felt as if the Beyerdynamic really came alive and sounded much more interesting and dynamic on an exterior than it did on interiors. The Neumann KMR-81i exhibited a remarkable isolation on my voice outside, it almost felt as if I was in a VO booth, the off-axis rejection was that good. The KMR-81i also warmed up my voice, adding a smooth bass/mid emphasis that was appealing to my ear. In a lot of ways, this microphone, even though it is a shotgun, seems to feature a lot of the same qualities that Neumann large diaphragm studio condensers feature. This microphone seemed to be ideal for exterior situations. As you listen to the sample, keep in mind that the mic was located about a foot to a foot and half over my head! I tested the Oktava with both the cardioid and hypercardioid capsules even though you would undoubtedly want to use the hyper for most exteriors. I very much liked the quality of sound for exteriors with the hyper, it sounded much closer in quality to the cardioid but you will notice that the ambient noise level went way down when I switched to the hypercardioid capsule. The overall sound quality on the exterior seemed a bit smoother to me than the interior clips. Very impressive microphone. The Sanken CS-1 had a very clear and detailed sound for the exterior but to my ear, it was picking up more off-axis sound in this situation than some of the other microphones. The transitions between the frequencies were very good though and overall, this microphone sounded very appealing. You would have to test this microphone to make sure that the ambient levels were acceptable for your needs. I liked this microphone better for interiors. The Sanken CS-3e sounded very good in the exterior test. I noticed less ambient sound than the CS-1 and a smoother, more bass/mid emphasis than on many of the other mics tested. The Sanken did not have the degree of off-axis rejection that the Neumann seemed to have but in a way, it's detail and high end were just a tiny bit more appealing to me. 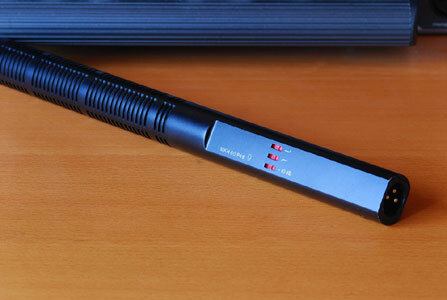 The CS-3e seemed to have more presence but it was not as "in-your-face" as some of the other mics. Overall, it presented a very well balanced and sophisticated sound on the exterior test. Wow! This microphone surprised me. I have always heard that few sound mixers use the CMC641 for exteriors. Because the CMC641 is a supercardioid and not a shotgun, I was not expecting very good isolation from off-axis noise and I was expecting that overall this mic might not keep up with the shotguns on exteriors. Listen to the clip, it sounds very impressive. I felt that the mic had excellent off-axis rejection and the overall quality of the sound was superb. Other than windy situations, I would have no problem in using this microphone for exteriors if this is the type of sound I could expect. Much like the Neumann KMR81i, this microphone basically makes all of your off-axis issues almost disappear. Very good isolation of the desired sound from background noise and I really enjoyed the warmth and intimate sound that the CMIT5u presents on an exterior. To my ear, the Schoeps has a less colored sound than the Neumann, which presents with more bass coloration, but in a good way. I did not have the time to record separate samples with all of the cuts and roll offs for this microphone but I am sure that they would be helpful to you in certain situations. Schoeps has really done a nice job with the CMIT5u, it sounds great on exteriors. The Sennheiser MKH-50 simply has a punchy, bass and mid emphasized sound in comparison with the Schoeps CMC641. I judged the off-axis rejection to be about the same but the two mics sound pretty different on exteriors. I would choose the Sennheiser MKH-50 for exteriors if you record female talent or talent with a higher or thinner voice. It can do wonders. As for my voice, I don't know, does it make me sound a little Barry White-ish? The MKH-60 was an outstanding performer on the exterior test. I heard very little off-axis sound but I never got a sense being in a VO booth that I had with the Schoeps CMIT5u and the Neumann KMR-81i. I would say overall, the MKH-60 shared a lot of similar qualities with the Sanken CS-3e. They both sound very natural on exteriors with the Sanken leaning slightly toward the mids and the Sennheiser leaning slightly toward the lows. Interestingly, the MKH-60 presents with a lot less of a bass feel than the MK-50 on exteriors. I really like the sound quality of this mic and I am told that the MKH-60 makes an excellent mic for hand booming by less experienced boom operators. It has some latitude and forgiveness in it's pickup pattern which makes it a natural for a beginning boom operator. Wrapping up the considerable amount of data I have presented in this article is a daunting task. It seems that audio beginners simply want someone to tell them which microphone to buy, while more experienced and knowledgeable users want to read more sophisticated arguments for each microphone tested, using complex descriptions and metaphors for the sound quality of each microphone. In the end, what I think of each microphone doesn't matter in the least; the paragraphs below are simply my opinion. The real goal of this article was to provide you, the potential microphone buyer with objective writing and audio samples so that you can determine which microphone(s) will suit your needs the best. I am consistently amazed by the sheer diversity in how we all use our camcorders and microphones. I have spoken with users from all over the world over the past decade, they are shooting in environments as varied as outer space, jungles, Antarctica, war zones, corporate boardrooms, weddings, live events, film sets, caves, underwater and many other strange, unusual and interesting places. It seems that few of us have the same experiences as we film, videotape and record sound. This reinforces my opinion that YOU need to critically evaluate your needs and eventual needs before selecting the microphones that will work best for your situation. I am listening to all of the audio samples I recorded as I imagine which situations each of these microphones could best be used in. I encourage you to do the same. Keep in mind that the method for comparison between audio components, whether microphones, mixers or audio monitors usually comes from A/B comparisons between your two or three most likely candidates. I have learned that our ears and brain have an incredibly short memory. Our ears and brain, because they are so adaptive to surroundings, also become easily confused. The most common mistake potential audio buyers make is to listen to dozens of potential candidates in a row. This will do nothing but confuse your ear and brain. If you are serious about evaluating these microphones for purchase, I would encourage you NOT to sit down and listen to all of the sound samples for all of the microphones in this article in one sitting. You will do nothing except fatigue your ear and confuse your mind about which microphones sound like what. If you are just curious and doing preliminary research, listen away, it doesn't matter, but if you are trying to narrow down which microphone to buy immediately, read on. 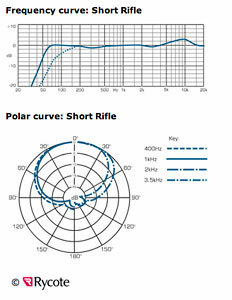 The best way to evaluate sound components begins on paper or on your computer screen. Do your research. Read manufacturer and sound magazine websites. Talk to people in sound forums. 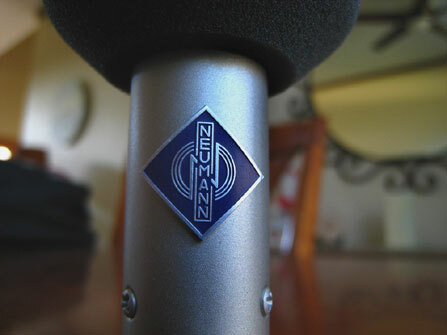 It is pointless to evaluate $2,000.00 microphones if you only have $500.00 to spend on one. In the end, you should base your buying decision off of a body of research, not from any one recommendation, not even this article. Most recommendations you will get about which microphones to buy are not objective. Take it all in, process and distill your opinion down with what matters most to you. Quality? Quality regardless of cost? Cost? Off-axis rejection? I would advise you to begin narrowing your selection by evaluating microphone candidates that are in your general price range by doing the research. There are several microphones tested in this article that are considered "industry standards". This, to me has always meant very little to my evaluative process. As in many other areas in life, buying into what the status quo uses is sometimes a good thing but often, you can discover a microphone that costs less and provides superior results for your particular needs. This piece of gear may be the same microphone that most other people use (cough, cough, Sennheiser MKH-416, cough) or it may be a microphone that few people have ever considered, often because not every great microphone company is a multi-national conglomerate with a huge advertising budget. The bottom line is to have an open mind and ear and truly evaluate what will sound best and work best for your situation. Do You Have Feelings of Guilt? Once you have lined up potential candidates, the best of all worlds is to get your hands on a sample and use it. Nothing beats an ears-on demonstration. If you visit a quality location sound dealer, almost all will let you evaluate potential microphones that you may purchase from them. Location sound is one of the few industries where there are still many small, quality companies nationwide that offer great advice and service. In my opinion, it is bad form to go to an audio dealer, pick their brain, put your hands all over numerous microphones, then walk out and purchase your selection from that huge dealer in NYC over the Internet because they have the same microphone $50.00 cheaper. People who do this (you know who you are) think that you are smart because you can get the microphone cheaper on-line but in reality, they are making a seriously short sighted decision when they do this. The decision they make could eventually put all of our best small audio shops out of business. I am all for capitalism and getting the best deal, just realize that the best deal is not always the lowest priced deal. Taking care of you after the sale, offering ongoing advice and bailing you out on a Friday late afternoon for a weekend shoot are all things that my favorite two or three audio retailers have done for me over the years. A good location sound dealer is easily worth paying a few bucks more to in exchange for better service. This microphone was the little engine that could. Frankly, I did not have very high expectations for this microphone. It was a brand new, still unproven commodity. It was really inexpensive. In reading Audio-Technica's literature, it was clear that the main design criterion was usage as an on-camera microphone. The more I thought about though; on-camera usage isn't really that different than using a mic on a boom pole overhead. Sure, you can usually locate a boom mic closer to the source than on-camera, but good sound is good sound. I knew that if Audio-Technica engineered the mic for on-camera usage, it would probably be fairly isolated from handling noise and would have pretty decent pickup from a distance. I knew going in what the price was on this microphone but I made an effort to try to forget the price of the unit as I evaluated it. This mic finished particularly strongly in the mic handling test and I really enjoyed it's sound with the female talent. All in all, if you are on an extremely limited budget, you could record good quality audio in many situations with the AT875R. 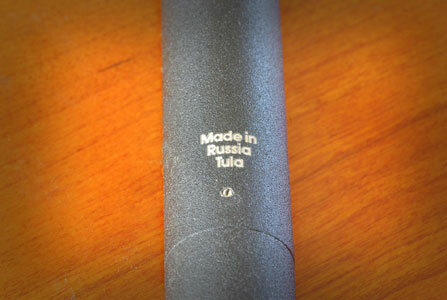 This microphone is a perfect example of the price paradigm in these types of microphones shifting. Before I tested this mic, if you would have told that you could purchase a seriously high-quality sounding microphone for video/film usage for it's price, I would have disagreed. The AT875R is a very impressive new product and I highly recommend it as one of the best low cost mics on the market for film/video use. It does not have the smoothness of sound, transient response, nuance and off-axis rejection of the more expensive microphones but in the right hands, it still makes good quality recordings for an amazingly low price. I have used this microphone for years. It is a solid performer. If you read around the sound forums, it is highly recommended by many users. I would term this microphone as an "industry standard" even. I found that in comparison to the other microphones evaluated, the AT4073a is a fairly unique microphone that has some particular strengths as well as some areas that it was not as strong in. I was struck each time I used it by the 4073a's amazing efficiency. This microphone puts out a seriously higher nominal audio level than the other mics. The other recurring theme is one of crispness. This microphone sounds basically at the other end of the spectrum than most of the other microphones. Would I recommend this microphone if you mostly shoot interiors with lots of reflective, hard surfaces? No, I would not. In those sorts of environments, the sound could become a bit brittle. I would recommend the 4073a if you shot in a lot of absorptive environments. Picture a room in which you are shooting an interview. The room has silk wall covering, plush thick carpets and rugs and large, puffy furniture. In an environment like this, many of the other mics would present with a muffled, probably too bassy sound. Not the AT4073a, it would be perfect for this sort of situation. Its crispness would really cut through such muffled acoustics. Same thing with exteriors. If you are booming and cannot locate the microphone a proper booming distance of 1-2 feet from the subject, the AT4073a would be an excellent choice. With it's increased sensitivity; it would probably pick up at least adequate sound from as far away as 4-6 feet from the subject. This microphone is an excellent example of why I suggest your kit contains at least two Shotgun/Cardioid variant mics. This microphone is outstanding in certain physical environments and not as impressive in others. If you combine the AT4073a with a microphone with smoother sound and less high-end response, between the two, you would have a lot of different audio situations covered. The Beyerdynamic MC-836 represented an interesting enigma. I liked how it sounded overall but it did not seem to be a standout performer in any of the test situations except the exterior test. I would say that the main term that comes to mind when evaluating the test clips is balanced. The MC-836 did not seem to be particularly impressive on the interior tests although it did not do badly on any of them either. The unusual thing about this microphone is that even in it's test results, the microphone was balanced. There were other microphones that excelled in certain areas but they also tended to have more distinct disadvantages as well. Not the Beyerdynamic MC-836, it did at least decently in all of the tests. The microphone really came into it's own on the exterior test, I liked it's sound much more for exteriors than I did for interiors. I did also really like the detailed smoothness that this mic presented, the smoothness was on par with some of the much more expensive microphones. This MC-836 presents with emphasis on the mid-range, so if you have soft spoken or whispery voiced talent, this microphone could be a viable alternative for helping to emphasize this voice. The Neumann KMR-81i lives in the sound bags of a lot of working sound mixers. Neumann has quite a reputation for building outstanding world-class large diaphragm studio condenser microphones and from what I experienced, Neumann has successfully managed to infuse the KMR-81i with much of the same sound quality and mystique. The KMR-81i has a very rich and detailed sound that I found extremely pleasant to work with. I used it on a project that featured interviews with several students at a design school. The area we had to shoot the interviews in was not a good sound location; it was situated in between two open classrooms just off of a heavily trafficked hallway. The results were outstanding; we hardly picked up any of the din from down the hallway that was totally apparent to our ears. On the other hand, I recorded with this microphone in a few instances where I would have liked to hear a bit more "room tone" mixed in with the voice. The isolation from off-axis sound is almost too good with this microphone sometimes. In certain quiet environments; it can be nice to hear a bit more of the environment mixed in with the voice. Just keep in mind that these situations are much more rare than shooting in environments with too much ambient noise. In a few of the recording situations, this microphone almost sounded like a really full bodied sweet sounding lavaliere, it sounded close mic'd even though the microphone was almost two feet from the talent. The off-axis rejection is top notch; the quality of sound is outstanding. This microphone isn't inexpensive but it is worthy of your consideration as a top of the line sound tool that will last you for many years, and will be useful in many different sound situations. If you want a premium sound and are willing to pay for it, definitely consider the KMR-81i. Talk about baggage. 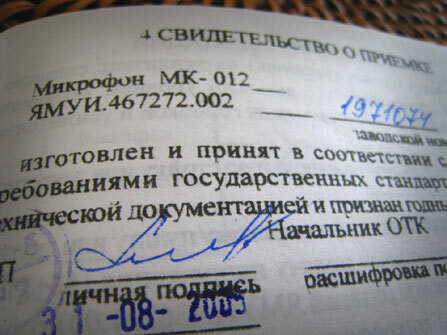 The Oktava came to me with some reputation. I had heard a lot of different buzz about the MK-012 from users and the forums. Some describe it as a "poor man's Schoeps", others have been dismissive about it. The Oktava is unusual in that it is made in Russia and is quite well accepted and popular all over the world. One feature that I thought would be very appealing to me was that the Oktava MK-012 is available as a three capsule set with an Omnidirectional, Cardioid and Hypercardioid included along with a -10dB capsule to reduce sensitivity. If you are an all-around sound recordist, this kit is a great value, the Omni and Cardioid capsules are great in the recording studio and in the field. If you mainly shoot video/film sound, you will find that the Hypercardioid capsule is the best for most video/film situations so you may be able to save some money by purchasing the power supply with only the Hypercardioid capsule, although I liked the Cardioid capsule for certain situations as well. The Oktava sounded great. The MK-012 is an amazing value considering it's low price. The MK-012 is also physically tiny, which for many sound for picture situations can be handy. The Oktava was a solid performer in all of the tests, save the handling noise test. 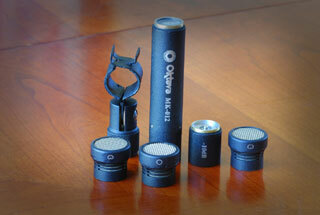 It is true that the MK-012 is more susceptible to handling noise than many of the other mics tested. If you are planning on hand booming with the MK-012, my advice it to purchase the best microphone mount you can find and practice with it for a while before shooting. A professional boom operator can probably deal with the handling noise just fine but an amateur boom operator like me would have issues with it. Oh yeah, to my ear, the Oktava didn't sound as full, smooth and uncolored as either Schoeps but it did sound amazing for it's modest cost. To me, the Sanken CS-1 fulfilled my expectations. 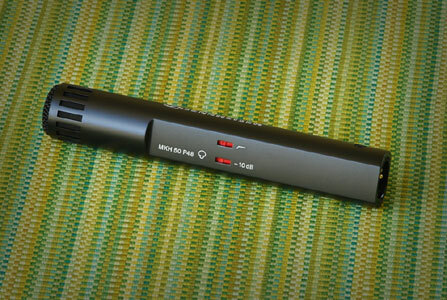 I expected it to have more detailed and smoother sound than the other $1,000.00 and under microphones. It did. I expected that it would not sound as detailed or smooth as the $1,000.00 plus microphones. It didn't. I have heard a lot of satisfied owners on the sound forums talking up the CS-1, saying that it is the best thing since sliced bread, so to speak. It was interesting to test both the CS-1 and CS-3e together. To my ear, I found the sound of the CS-1 to be clear, clean and detailed. 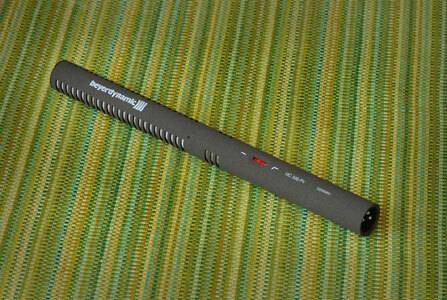 The CS-1 did not have the warmth or bass emphasis that some of the more expensive microphones seemed to have; it probably has a less colored sound. I also get the impression that the CS-1 may have been primarily designed as an on-camera mic, much like the Audio-Technica AT875R. It's handling noise was very low, I would say the best of the sub-$1,000.00 microphones. The CS-1 is one of the microphones that presents with a little more room tone than some of the longer shotguns. This is neither good or bad overall. If you were recording in a very noisy environment, this mic could pick up too much ambient sound but in a quieter environment, I really liked hearing a bit of the environment. Some of the longer shotguns almost sounded sterile, the CS-1 sounds more "real" as far as integrating the voice with it's surrounding environment. This is another point for owning more than one of this type microphone; there is no ideal mic for all sound situations. The CS-1 was a solid performer; it's great reputation is well deserved. I had a sense of Déjà vu as I first listened to the Sanken CS-3e. Hmm...I have heard a mic that sounds like this before. Which one was it? Oh yeah, the Sanken CS-1. I should clarify, the CS-3e sounds better than the CS-1. It sells for almost twice as much so it should. I found that the better bass response and considerably better off-axis rejection of the CS-3e makes it an outstanding microphone. This is a classic case of the CS-1 being very good and the CS-3e being better. The CS-3e also did very well in the mic handling test, suggesting that this could be an ideal handheld boom mic for interiors and exteriors. The CS-3e also did very well in the exterior test with a nice mixture of isolating the voice but also letting in a natural sounding amount of ambient. For female voices, I really liked what the CS-3e could do, it made the talent sound open and natural. I felt that the Sanken CS-3e offered basically a similar level of performance and sound quality as the more expensive German mics yet sounds different than the German mics. You would have to determine if you prefer its sound over the more expensive Neumann, Schoeps and Sennheisers. I really liked it and would be very happy to have one in my sound bag. Much like the Neumann KMR-81i, the Schoeps CMC641 is, frankly, an audio legend. It is expensive, like the Neumann, and you will find it in MANY professional sound mixers' kits. Schoeps mics are also perhaps a bit more difficult to find, although I have noticed that one popular NYC "box house" is now carrying this particular microphone. So, to get right to it did the Schoeps CMC641 live up to it's reputation? In a word, definitely. The Schoeps had a natural, uncolored sound that really made me forget I was listening to a recording. If I recorded lousy sounds with Schoeps, they sounded lousy, as they should. If I recorded a great sounding source, it sounded great. The Schoeps gives you what is probably the most realistic sound picture of any of the mics I tested, what you hear from it is what you get. The Schoeps is, like the Neumann, a serious piece of German workmanship. From the gold colored engraved name and model number to the no-nonsense crackle enamel finish, the Schoeps feels like a solid piece of gear. I hesitate to even use too many adjectives to describe the sound of the CMC641, other than to say it is VERY accurate and uncolored. I also feel that the Schoeps delivers what you are paying for. In this case, I feel that "industry standard" is a well-deserved badge of endorsement. If you knew how many television shows and how many feature films you have heard through this microphone, you would probably shake your head in disbelief. It's that good. If you can afford this one, you probably won't need to buy another main microphone for decades, if not longer. That said, if you treasure microphones that impart some of their own personality to your sound as most of the other mics did, you may be happier with some of the other models. 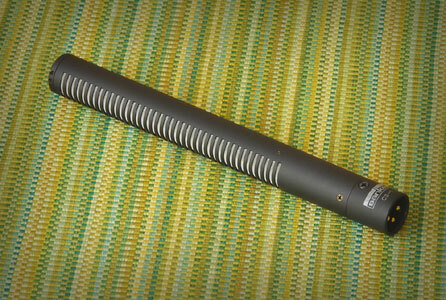 The Schoeps CMIT5u was a very interesting microphone. In some ways, it turns the industry on its side. Let's go down the list. First of all, it's a Schoeps! Schoeps has never made a shotgun and for many years, sound mixers have wished that Schoeps would distill some of the audio magic from mics like the CMC641 into a shotgun form factor. Check. Next, it has active electronics built into the microphone body with really cool little buttons with LED indicator lights. Besides looking interesting and high-tech, the boosts and roll offs are much easier to implement than with the traditional small, cheap dipswitch. Personally, I have to be reminded by bad rumble usually to implement the roll off on most of the mics that I use that have the roll off. With the CMIT5u, I found myself often just clicking through the switches because it was so easy and convenient. The light show has another practical feature, as a shooter, I can look over and at a glance, receive visual confirmation about which boosts and or roll offs I am using, very handy. Lastly, Schoeps has really gone all out to ensure that anyone who sees this microphone notices that it is something different. The color and finish on the CMIT5u is beautiful and not in an ostentatious way. 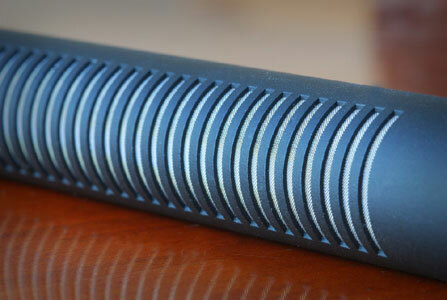 The blue anodized finished is simply exquisite. Nope, it doesn't make it sound any better but it does make it a joy to use because it is just so cool looking. (Sorry, I can't help it, I love the way it looks). Check. Last unique feature, the weight! 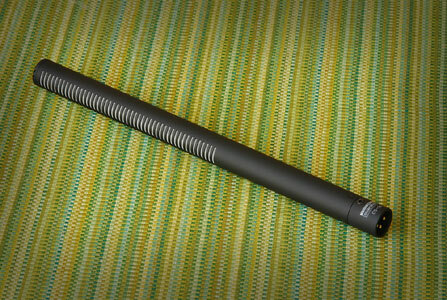 Man, this mic is long and rather large in comparison to the CMC641 but it weighs a LOT less than the CMC641. If you are hand booming, you will fall in love with this mic, it has low handling noise, great off axis rejection and it is incredibly light. 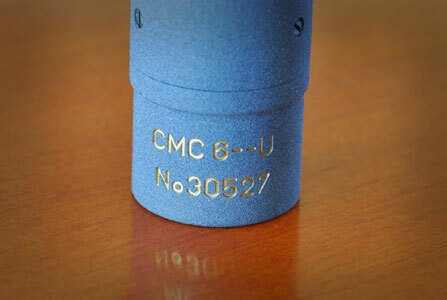 Interestingly, to my ear, the CMIT5u doesn't sound exactly like a shotgun version of the CMC641. The two mics have a distinctly different sound quality although they are in the same neighborhood. Neither is better or worse, they are just different. The CMIT5u obviously has better off-axis rejection yet the basic quality of the sound is slightly more colored, but in a good way. 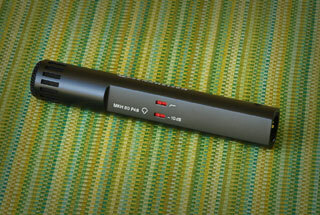 The CMIT5u was the second most expensive mic I tested and to be honest, I felt it was easily worth every penny. You will discover if you shop for this microphone, nobody seems to offer discounts on it. That should tell you something. It's a superb shotgun. 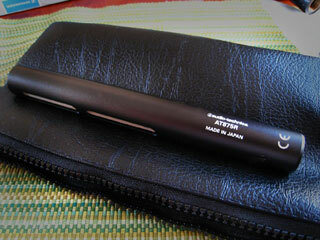 The Sennheiser MKH-50 was a microphone that I was really interested in evaluating. I have shot with the MKH-60 and MKH-416 for years but have never had a chance to use the MKH-50. It displayed a distinctly different sound than both the 60 and 416. It's difficult to put it into words but the MKH-50 had a very exciting sound. It made subjects sound big and dynamic. The MKH-50 is a very popular microphone; I have seen quite a few at work on the Hollywood television and film sets that I frequent. 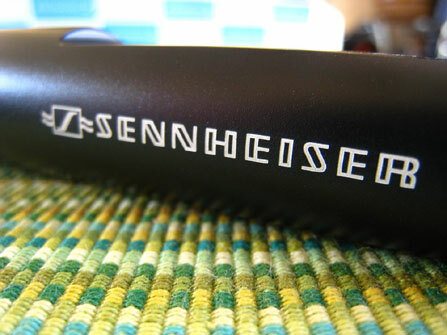 Sennheisers are very well built and smartly engineered. The look is low key and black. 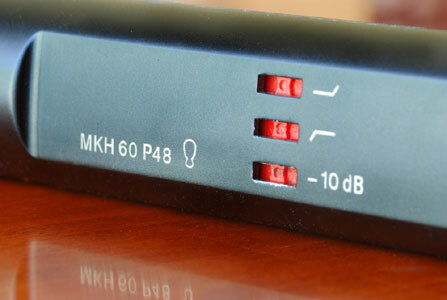 To my ear, the MKH-50 presents the sound with bass and mid-range emphasis. As always, I would seriously consider this type of sound if you record a lot of female talent, child talent or males with thinner voices. The MKH-50 makes them sound robust and gives their voices some authority. If I had to make a film analogy, this microphone sounds like an action thriller. It's exciting, dynamic and a blast to record with. If you look at sound characteristics as a palette, this sort of sound would be good for warmth and authority. If your talent already has a very deep or authoritative sort of voice, this microphone might not be the number one choice. I really liked how this microphone made my voice sound and I do have a fairly penetrating and deep voice so who knows, it's just a matter of taste and preference. Sennheiser has created a classic with the MKH-50. Unlike it's sibling, the MKH-50, the Sennheiser MKH-60 had a slightly more balanced sound overall. It produced less bass coloration on exteriors, had excellent off-axis rejection and did extremely well in the mic handling tests. 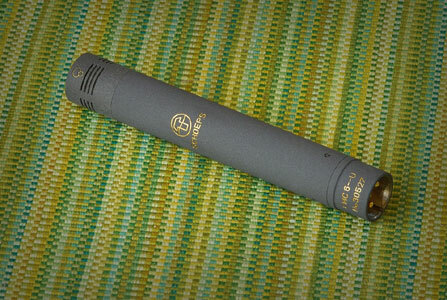 In exteriors, the MKH-60 seemed to compare more to the Sanken CS-3e than the other German microphones. After reviewing both of these Sennheisers, I could see that teaming the two of them together would result in a very complimentary microphone package, if not an inexpensive one. I have shot many hundreds of interviews with the MKH-60 over the years and it presents a very well balanced sound picture with a slight mid-range emphasis. Personally, I find that I really enjoy using the MKH-60 although it becomes rather transparent, like the Schoeps CMC641. After a while, you just don't notice the microphone's characteristics at all, you just notice the sound it recorded. I feel that the Schoeps is less colored than the Sennheiser but both of them present a very realistic sound. The MKH-60 holds the distinction of having the highest list price ($2,000.00) of any of the mics tested although actual street prices result in the MKH-60 generally selling for less than the Schoeps CMIT5u. 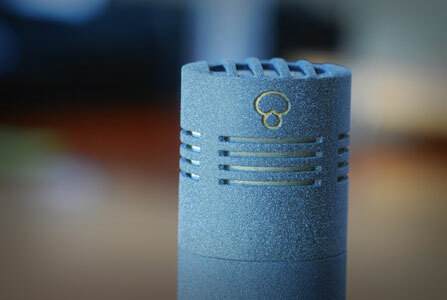 The Neumann is another world-class microphone from Sennheiser. It was a joy to work with. I hope that you have found this article a quality resource. Choosing the correct audio gear for your needs is always challenging. Fortunately, microphones don't have a tendency to change much; several of the models reviewed here have basically stayed the same for the past 5-10 years. A few of the models are newer and have introduced some new technology and new quality levels for unheard of price points. The most important thing to remember as you decide which microphone(s) to purchase is to buy quality and buy the product that best suits your needs. You should always challenge yourself to not scrimp and to buy the best quality audio gear that you can afford. Unlike cameras and computers, audio gear can really be an investment. With care, it will last you many years and will not need to be replaced by the newest, latest and greatest. Quality audio gear will also pay for itself quickly in saved rental fees. As with all other aspects of sound for picture, it's the skill of the operator that really makes the most difference. Having the most expensive or best performing microphone on the market won't make any difference in the quality of your sound unless you know when, where and how to use it. 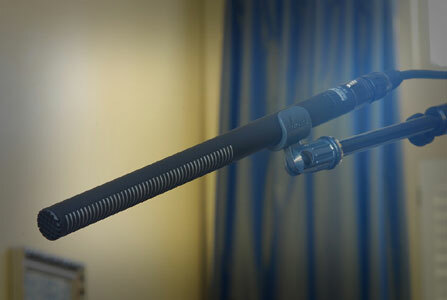 In order for any of the microphones in this article to work to their full potential, you need a quality microphone mount, wind protection, boom pole, cable, mixer and recording device. As you can see, the microphone is merely the first device in the chain. Dan Brockett, is an independent television producer based in Los Angeles, Ca. Dan's most recent projects include documentaries for the DVD releases of Paramount Pictures Braveheart: Special Edition and Warner Bros. Special Edition of Howard Hawks Rio Bravo. Dan is also known for shooting and producing two top rated episodes of A&E's Biography. Dan is currently in development on three television shows for 2008. Dan can be reached at dan@biglittlefilms.com.